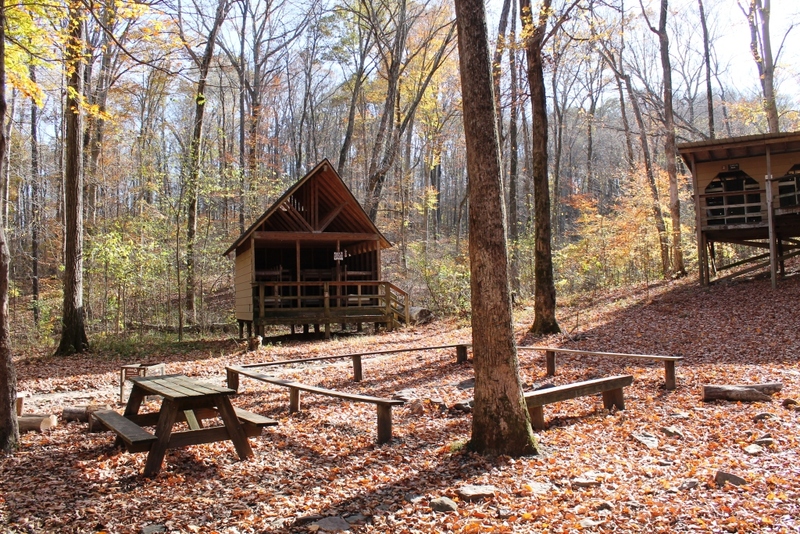 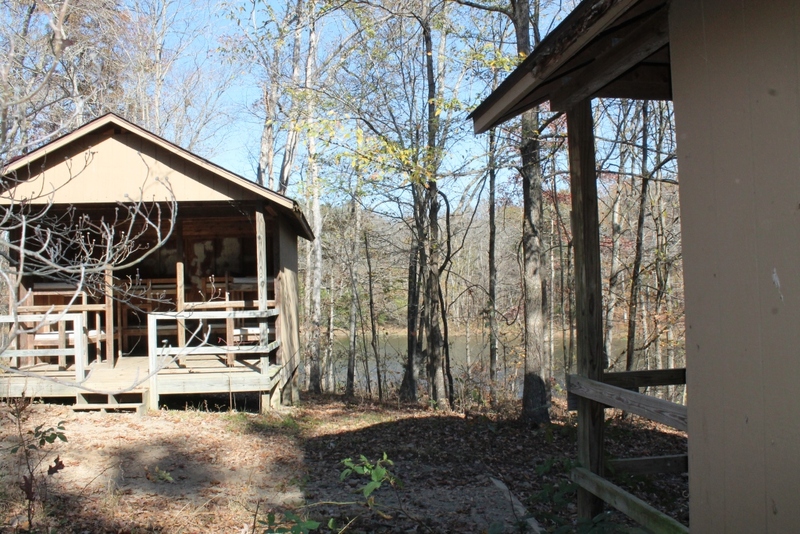 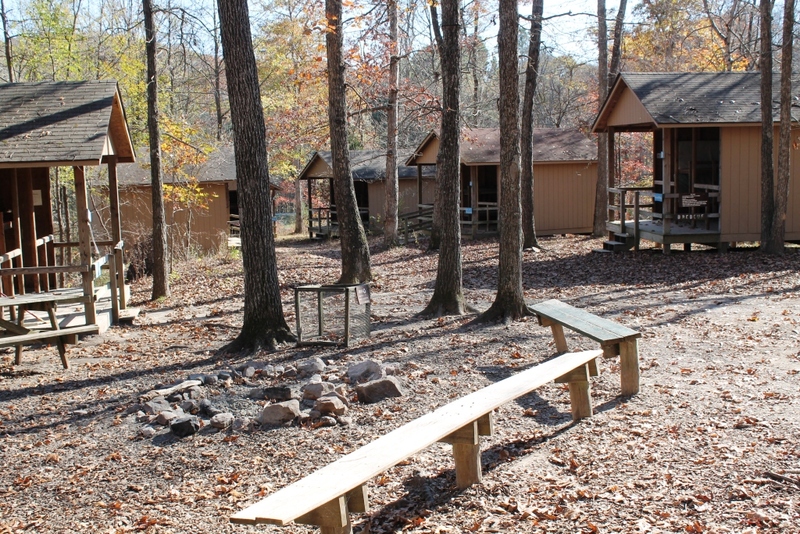 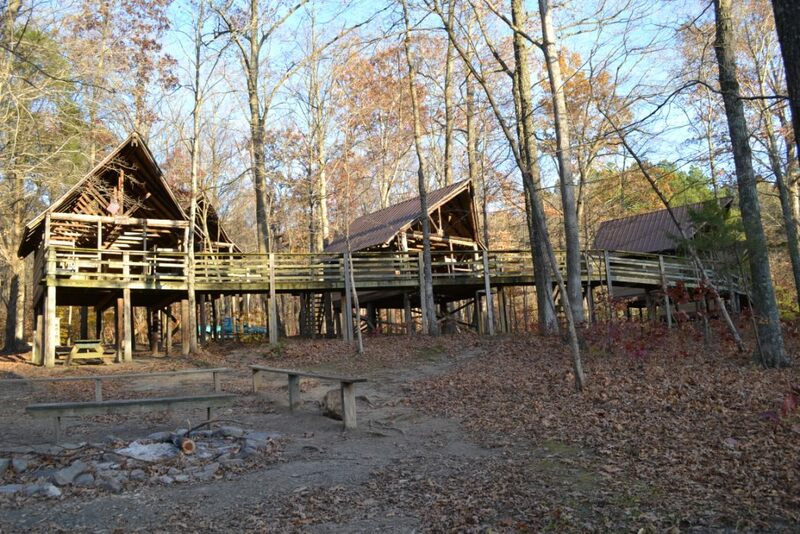 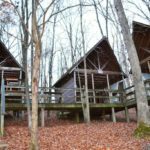 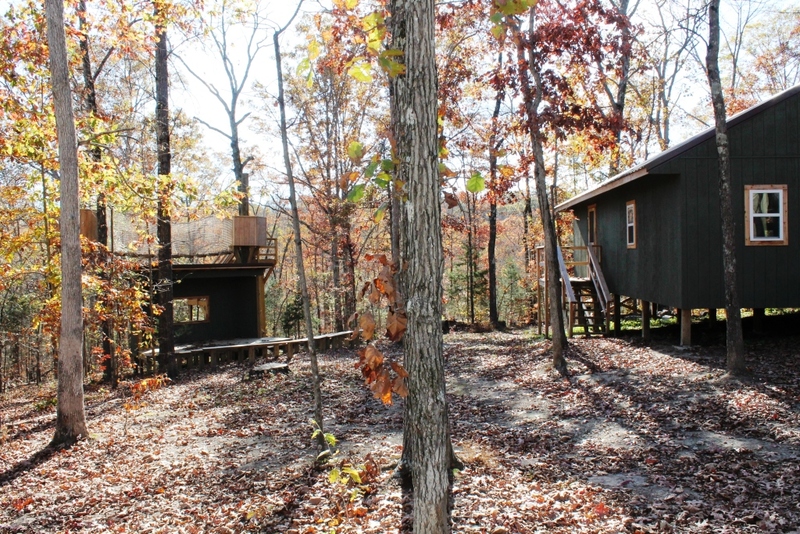 Camp Ondessonk has several cabin or tent camping options for any group throughout the year. 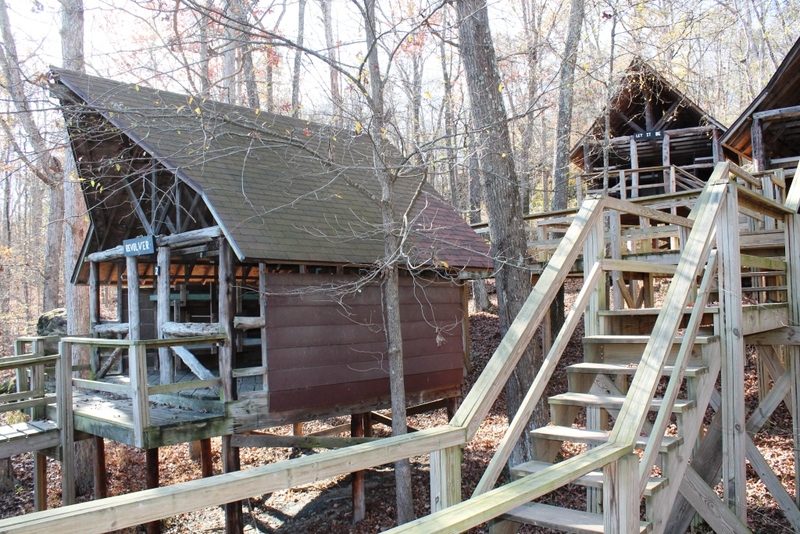 The amenities vary for each, but all are sure to provide a rustic and peaceful getaway for guests. 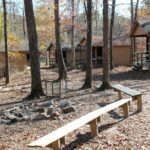 To make a reservation to stay in any of our cabin units or tent areas, fill out the Group Reservation Form found by clicking a link at the bottom of this page. 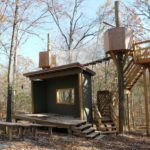 One of the highlights of any Ondessonk visit, our 3-sided treehouse cabin units take full advantage of their natural surroundings. 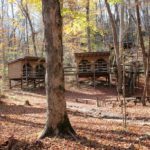 They are intentionally designed and located to maximize a visitor’s experience of tranquility and inspiration in Nature. 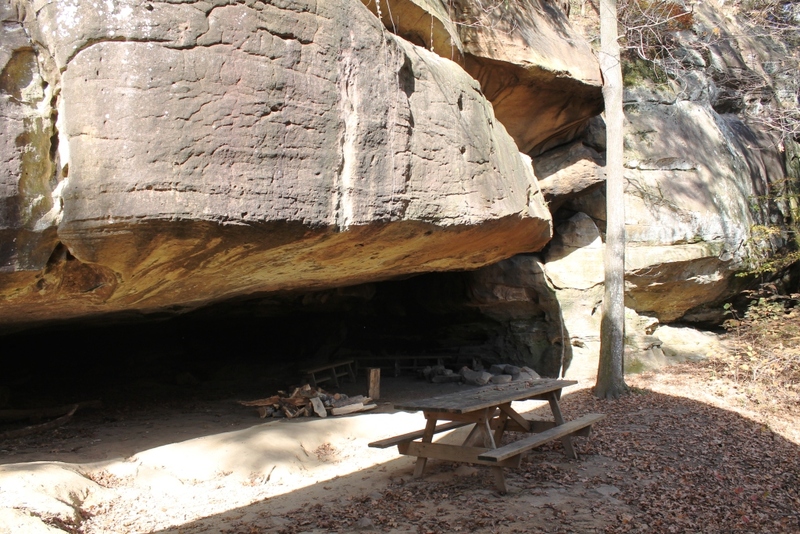 Some are on the ground for ease of access, one is built underneath a sandstone shelter bluff with its own waterfall, and others are walled in for a bit more security. 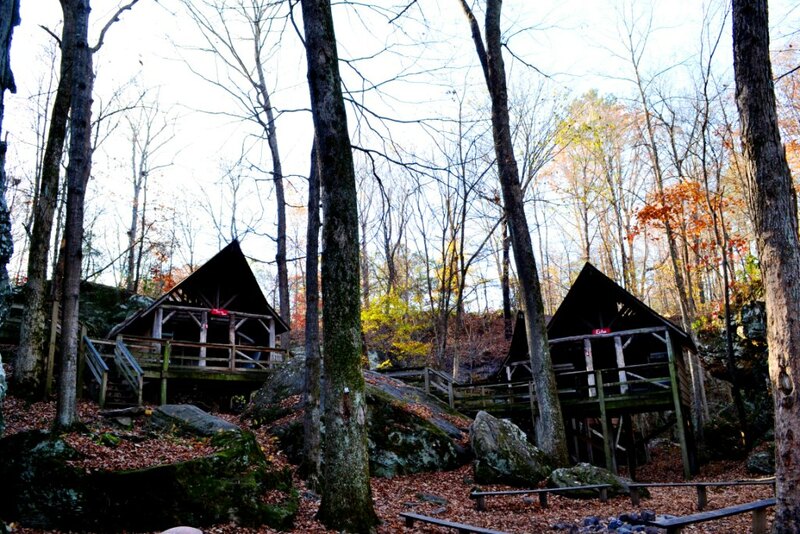 Whichever unit you choose, you will be introduced to the natural world in a unique setting. 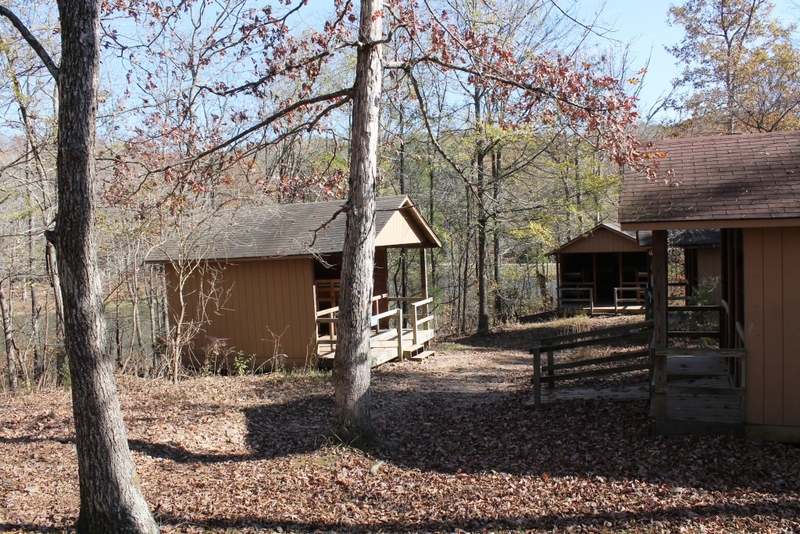 All of our cabin units have their own year-round water spigot, outhouse, fire pit, benches, picnic table, recycling bin, and trash can. 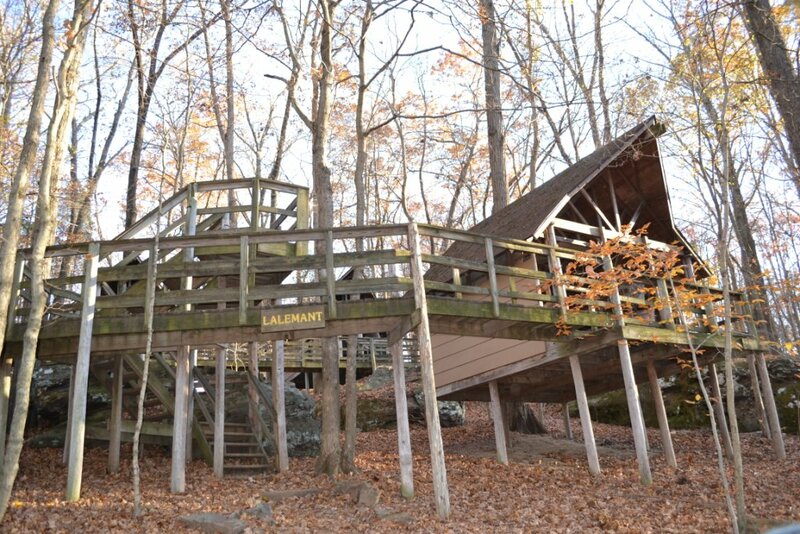 Nestled beside a bluff, the treehouse-style unit of Lalande is one of the most picturesque units at Camp. 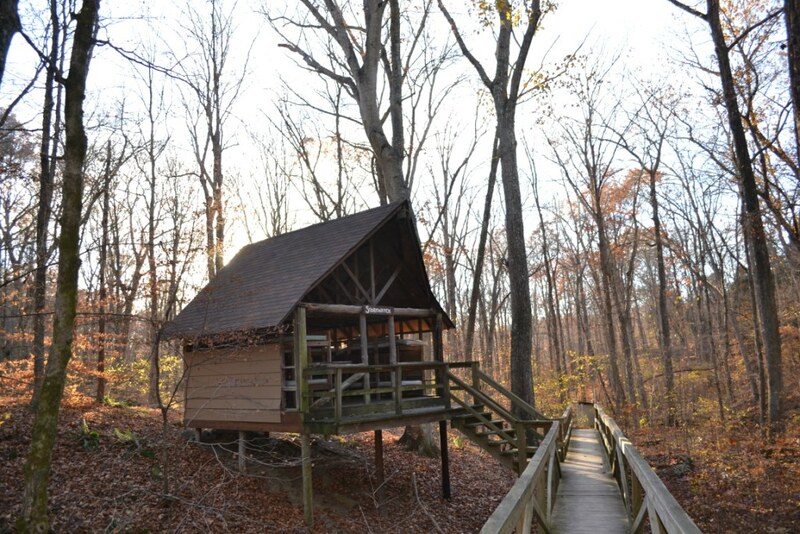 It is the closest unit to the heated Beach Shower House, and boasts its own waterfall! 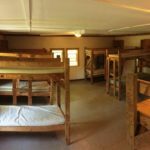 Lalande (pronounced lah-LAHND) has a capacity of 48 people in 6 cabins of 8 bunks. 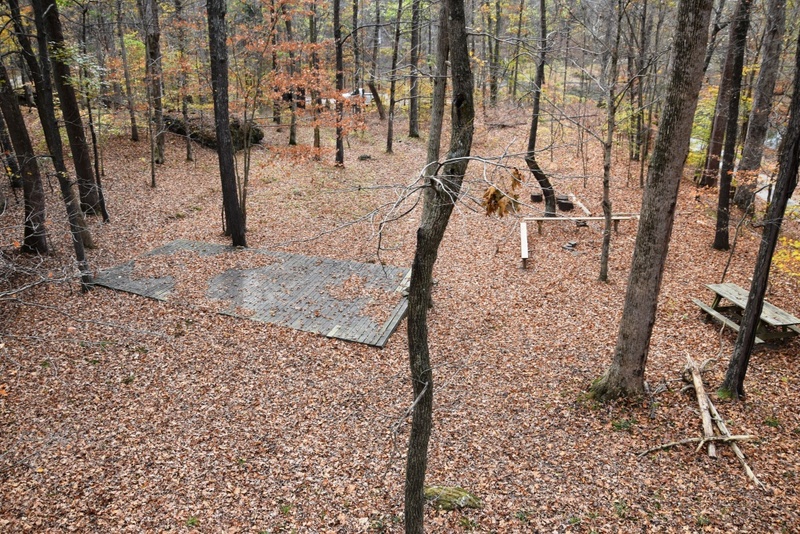 There is also plenty of tent space. 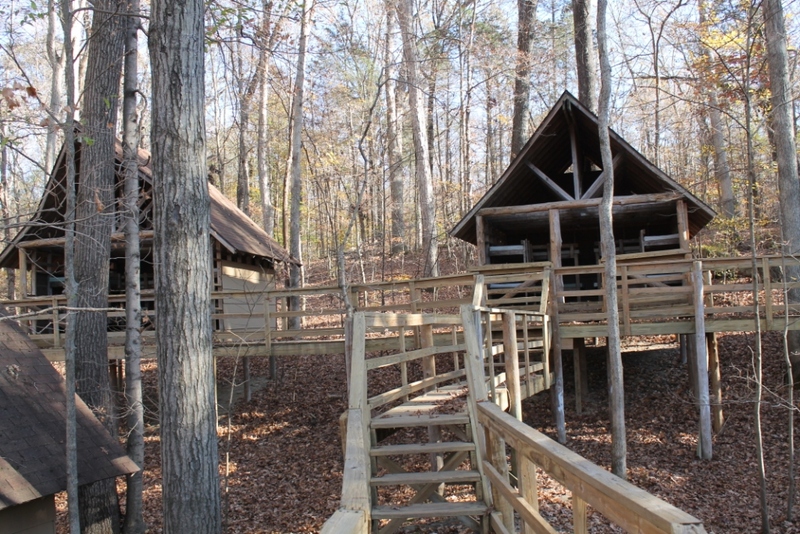 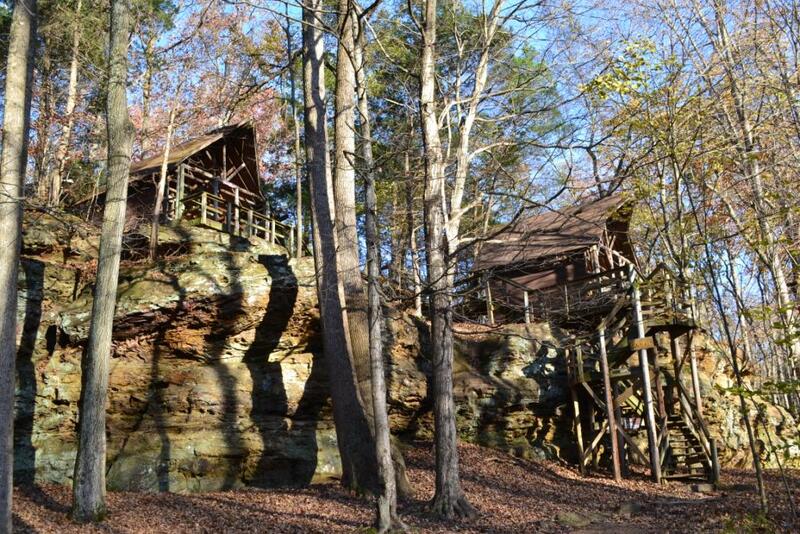 Situated atop a sandstone bluff, Goupil is one of the most unique units at Camp Ondessonk. 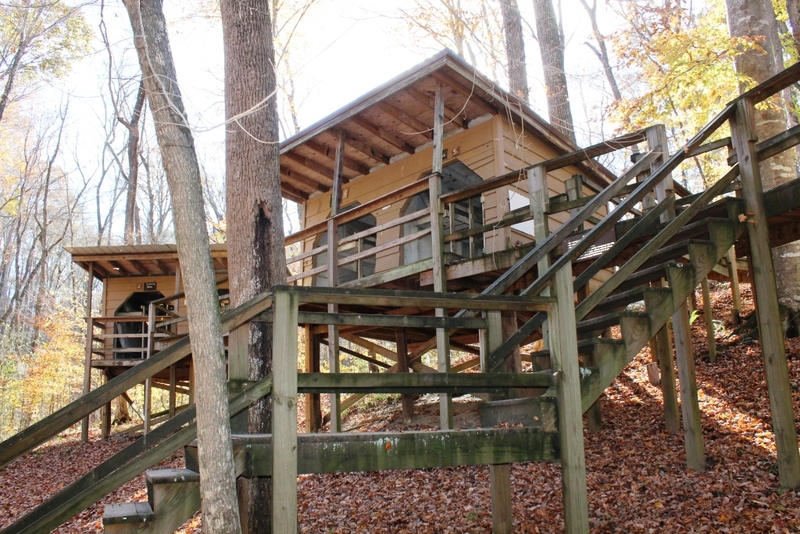 Goupil is aptly nicknamed the “Stair-Master Unit” because the amount of stairways that connect the cabins of this steep but beautiful unit. 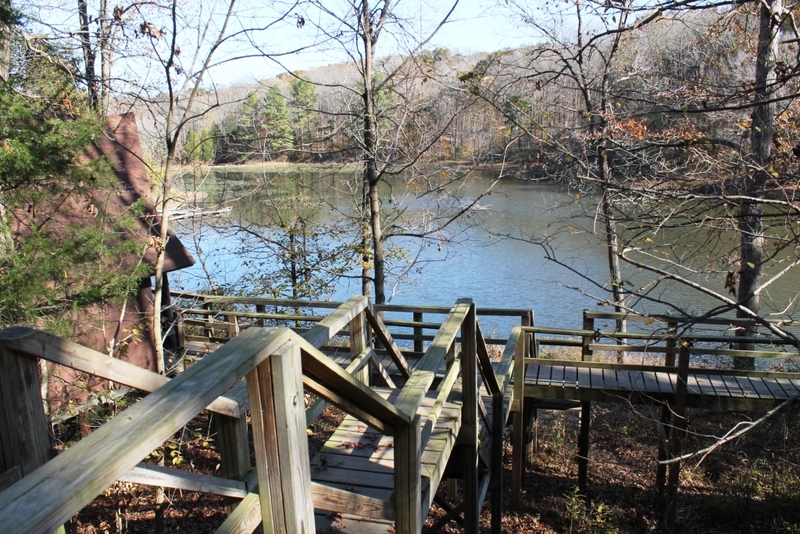 There is a great view of Lake Echon from the top of the spiral staircase. 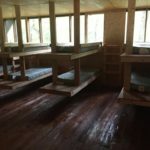 Goupil (pronounced (goo-PEL) has a capacity of 48 people in 6 cabins of 8 bunks. 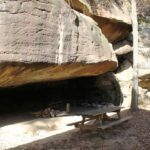 Chabanel is affectionately referred to as the “Cave Unit”. 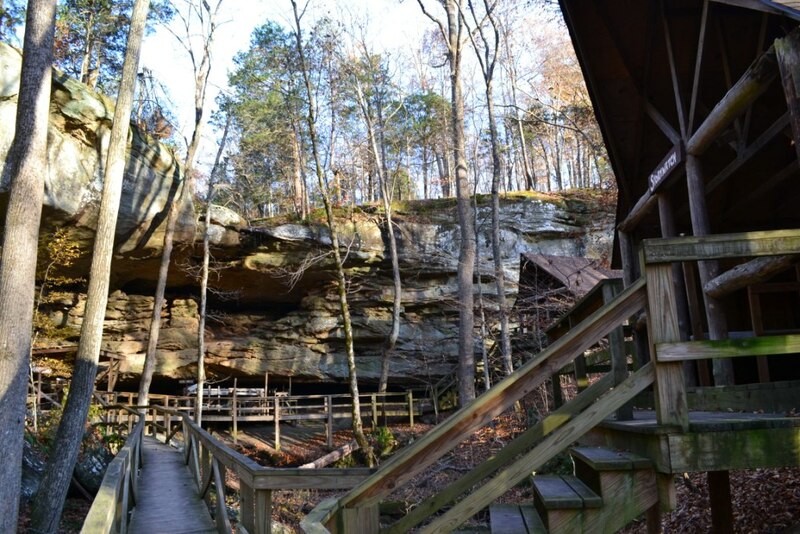 It is tucked underneath a sandstone shelter and behind a beautiful seasonal waterfall. 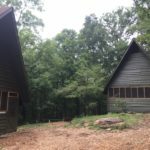 There is definitely no other unit at Camp like Chabanel (pronounced shah-bah-NEL). 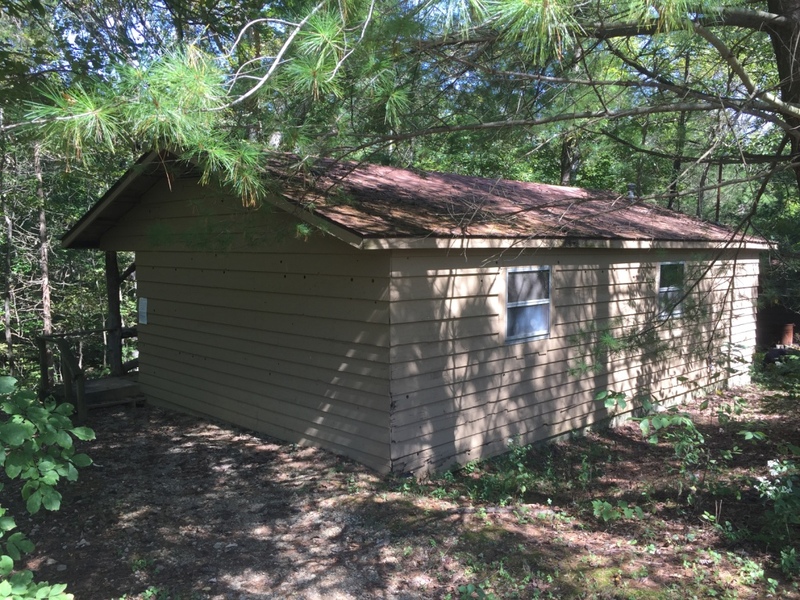 This unit has a capacity of 40 people. 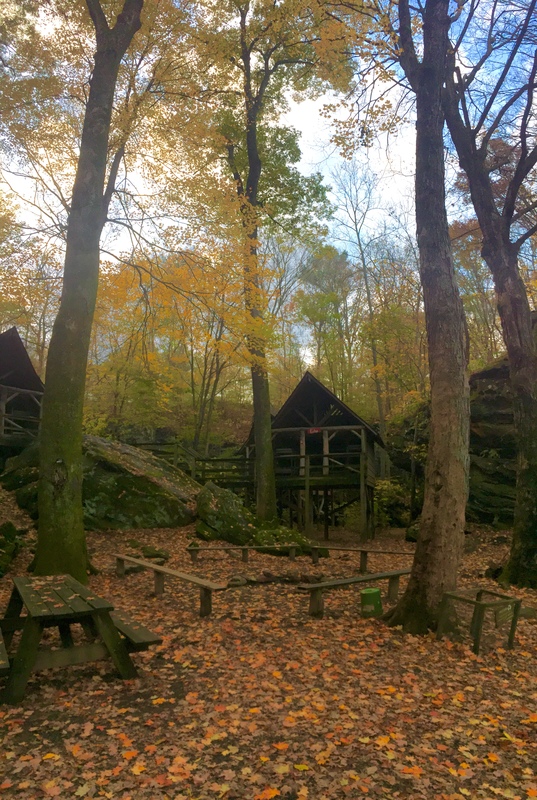 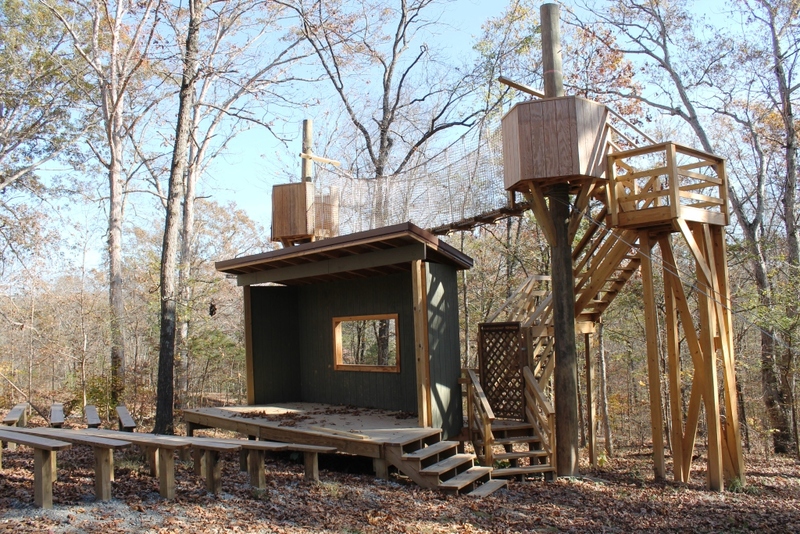 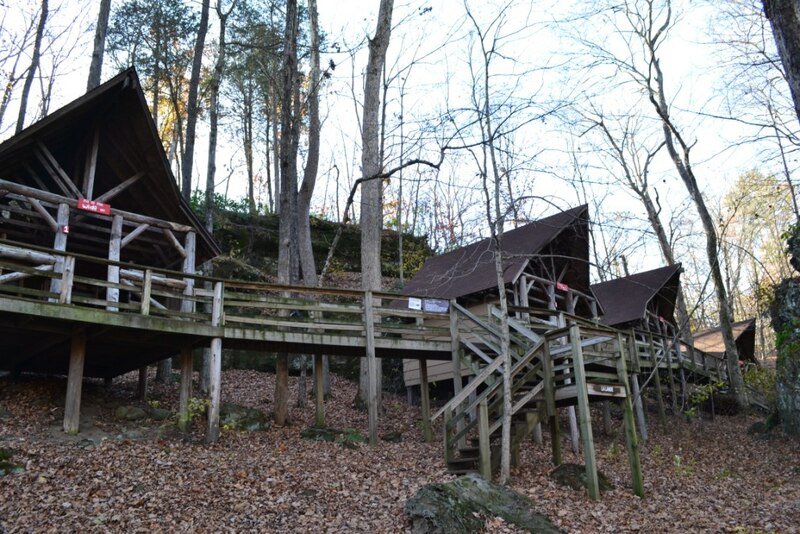 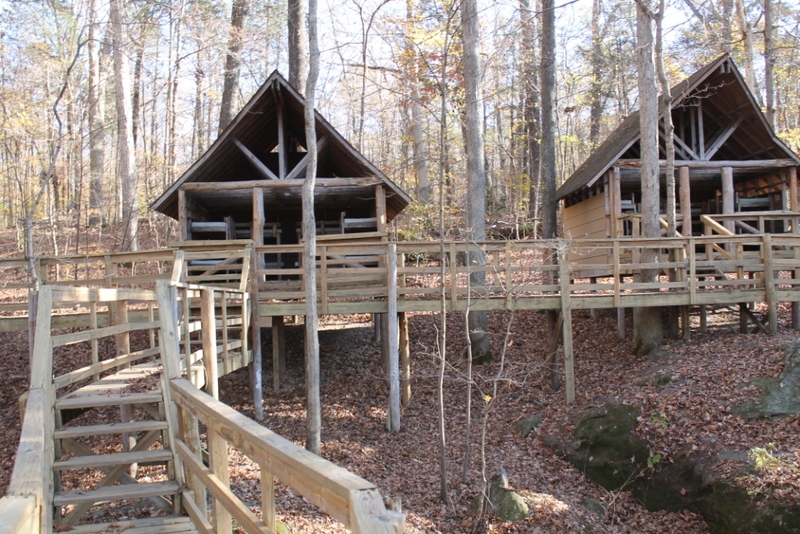 There are three bunk platforms under the rock and two treehouse-style cabins that all hold 8 each. 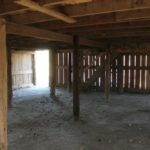 The unit of Lalemant is often overlooked, but also underrated. 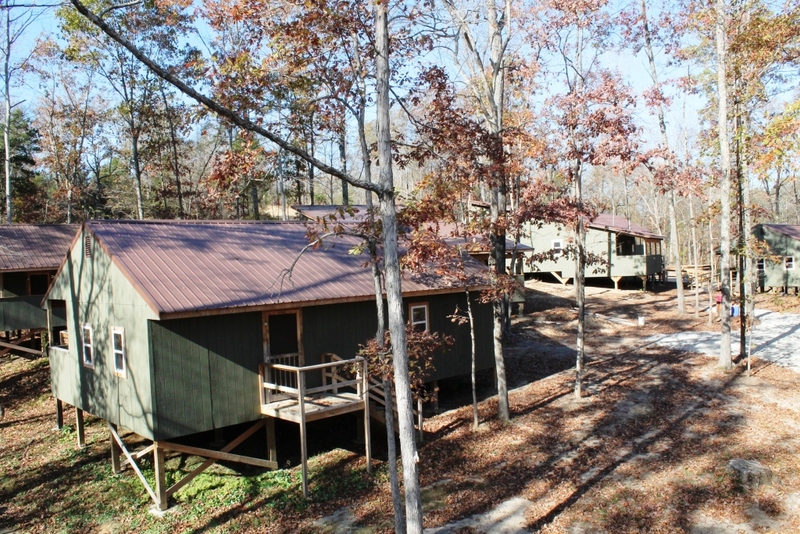 It’s one of the few units with it’s own driveway off the main Camp Road which keeps traffic and noise to a minimum. 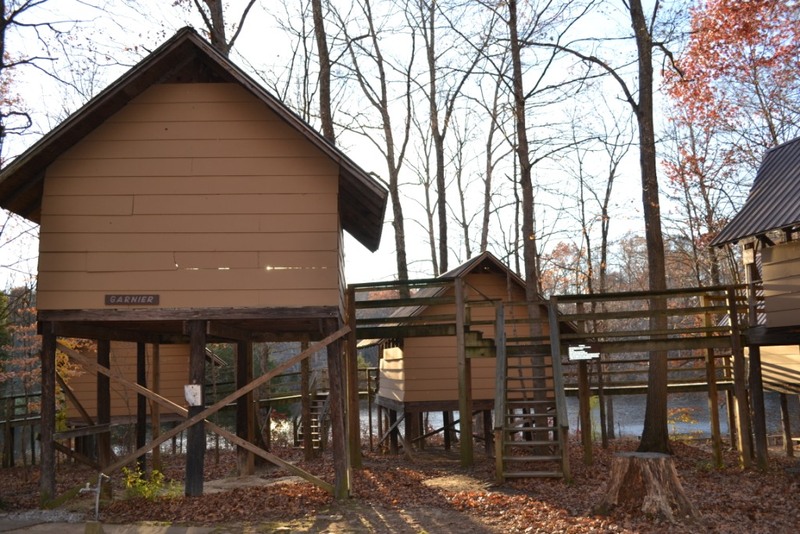 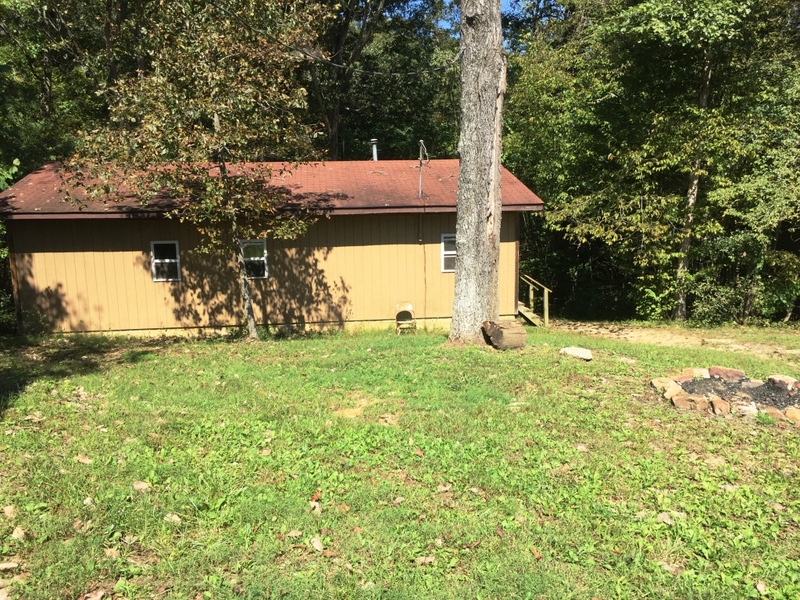 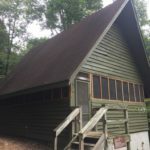 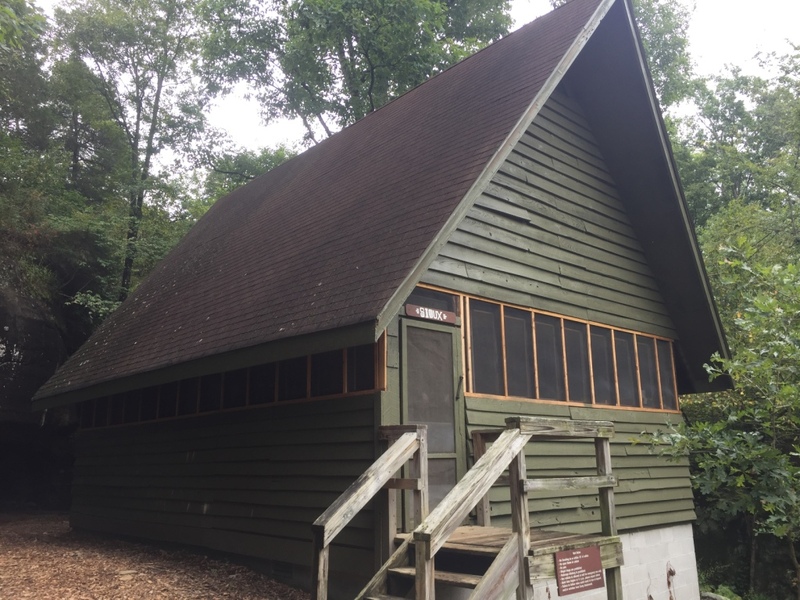 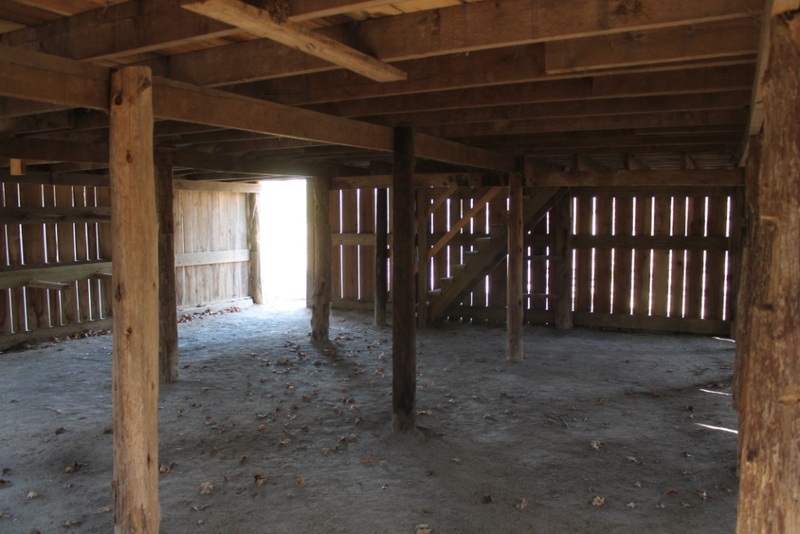 While it is one of the farther units from from the main area of Camp, it’s location is a perfect jumping off point to great spots on Camp’s East Side like Durbin’s Barn, Kane Lake, and the Pakentuck area. 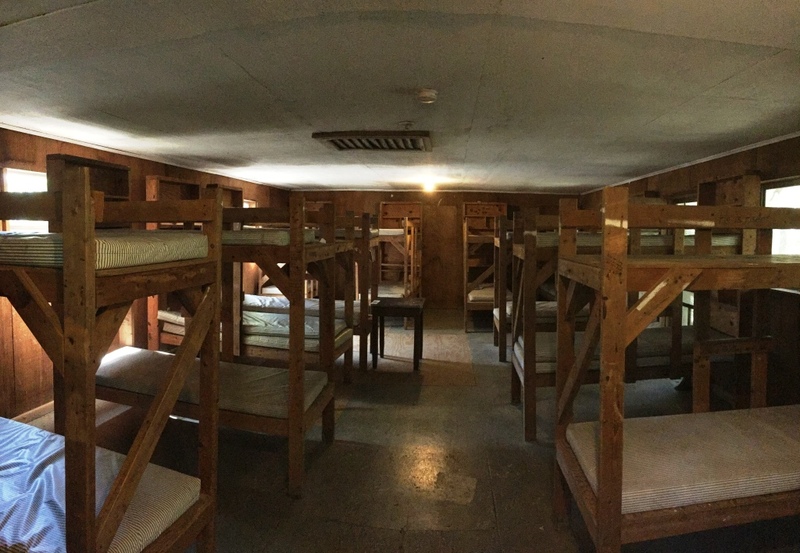 Lalemant (pronounced lah-leh-MAHNT) has a capacity of 48 people in 6 cabins of 8 bunks. 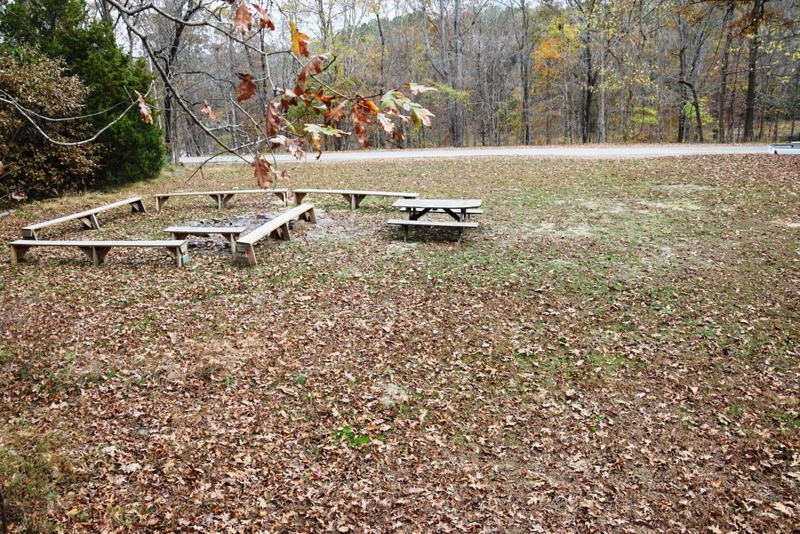 Garnier is a favorite unit of folks who want to be farther away from the main area of Camp. 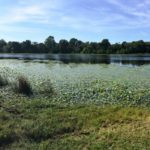 It is situated right on Lake Echon, which makes it perfect for fishing and there’s even a fish cleaning table. 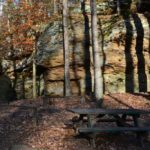 Garnier’s location makes it an easy walk to great hiking spots on Camp’s West Side and down the Cinder Path into the Shawnee National Forest. 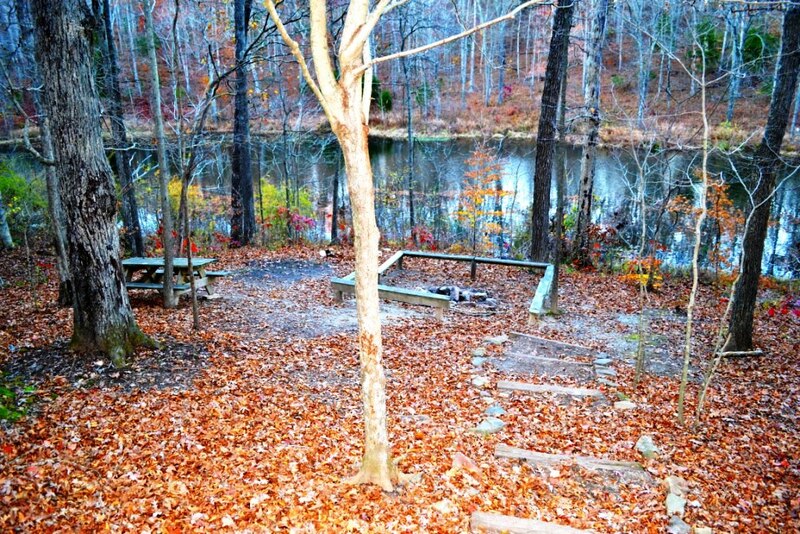 Fall asleep to the soothing sounds of running water over the nearby Spillway. 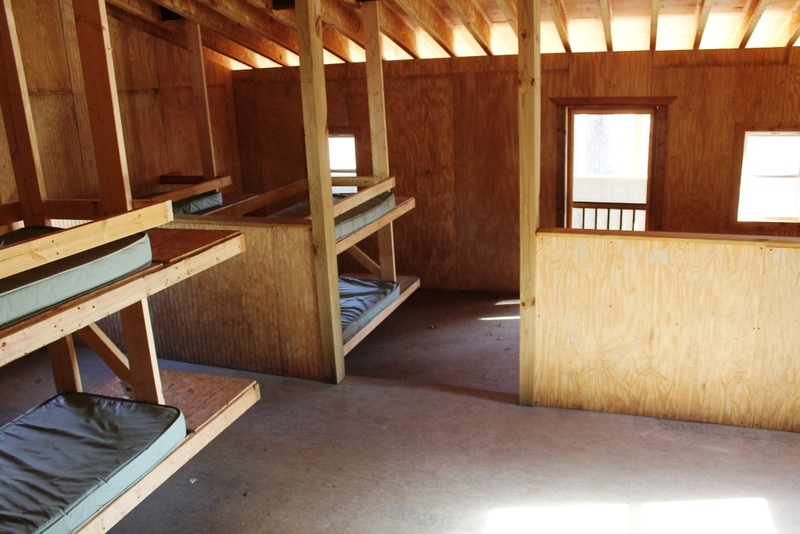 Garnier (pronounced gar-nee-AY) has a capacity of 48 people in 6 cabins of 8 bunks. 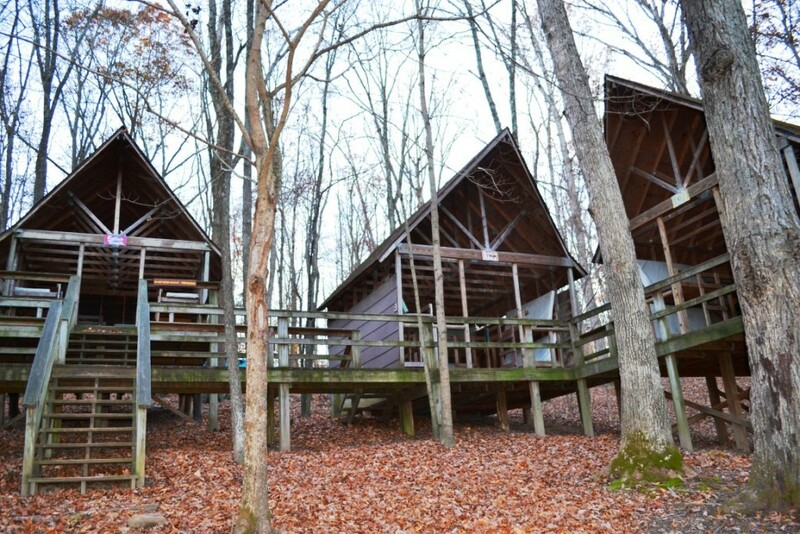 This is one of the closest units to the main area of Camp and our heated Beach Shower House. 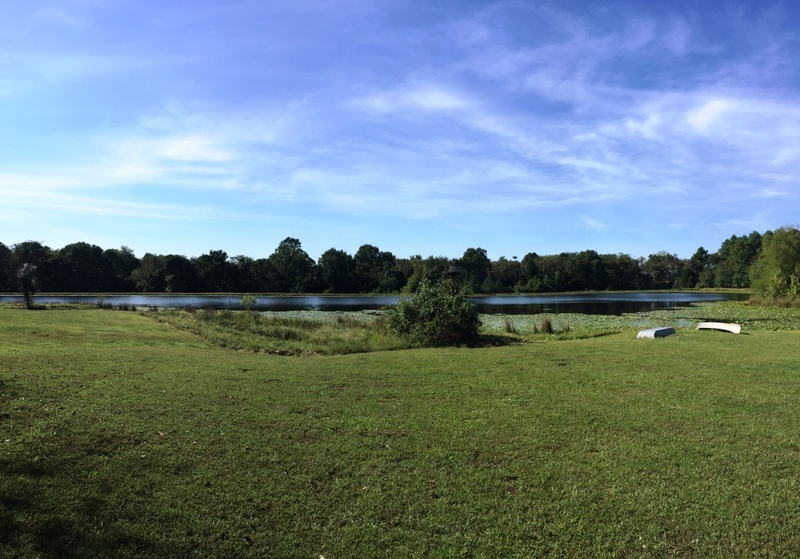 Daniel (pronounced dah-nee-EL) is situated right on Lake Echon and its eastern exposure makes it the best unit for sunrises. 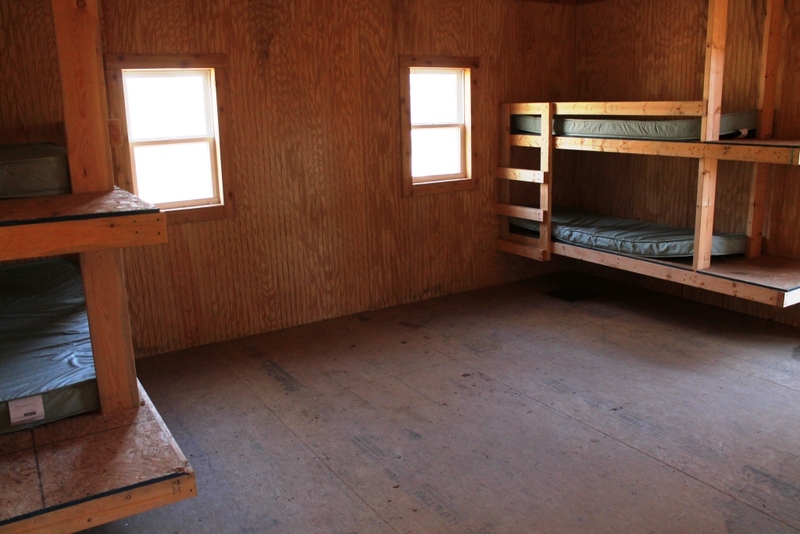 This unit has a capacity of 48 people in 6 cabins of 8 bunks. 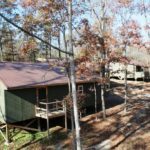 Collectively the John T. Fournie Mini-Camp Village, Chiwatenhwa and Aonnetta are the newest cabin units in Camp, built in 2015. 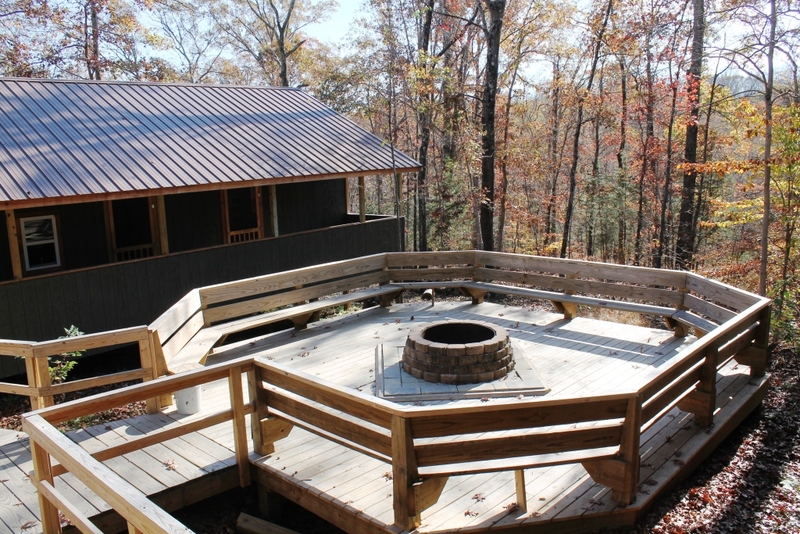 The two clusters of 3 cabins sleep 44 each, and each has its own fire pit area with benches. 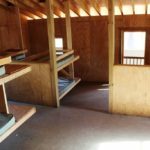 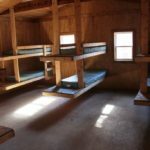 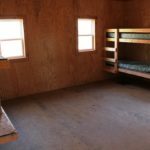 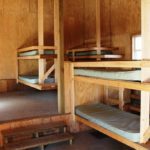 Each of the 6 cabins has a large side with 10-12 bunks and a small side with 4 bunks separated by a wall with a closing door. 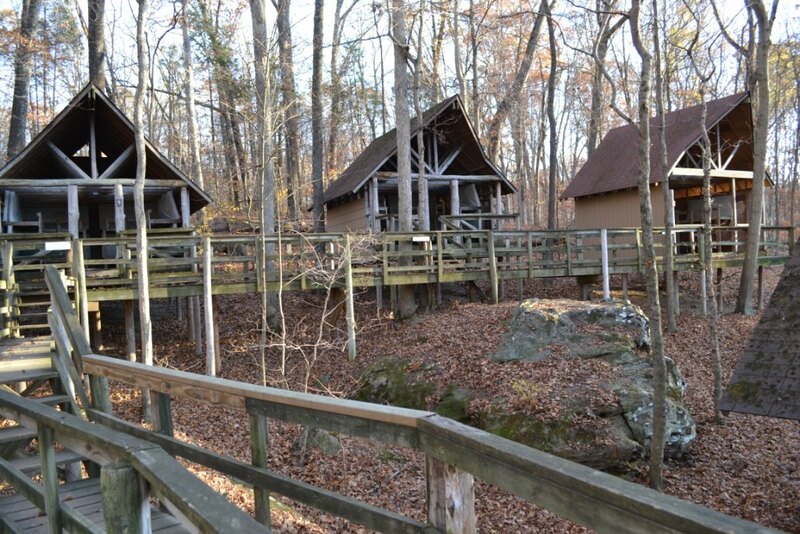 Chiwatenhwa and Aonnetta can be reserved separately on busier weekends, or as one big mega-unit for large groups. 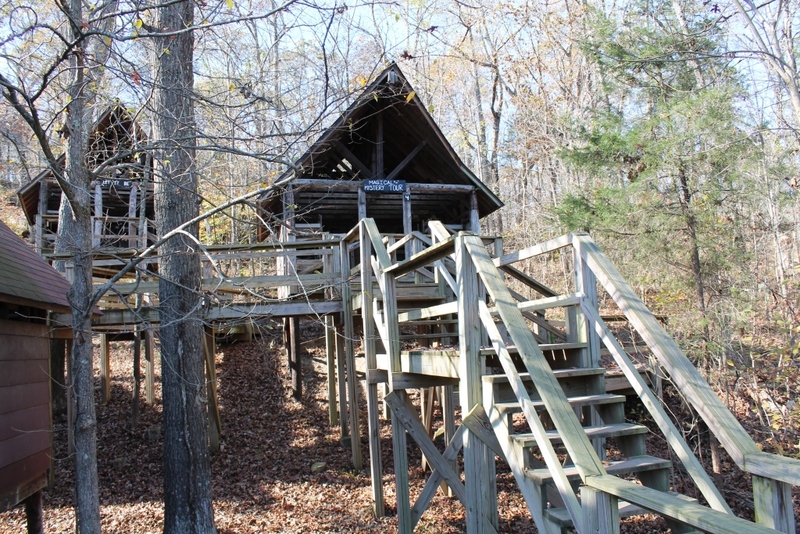 A paved driveway, parking area, and ramps make it accessible for anyone. 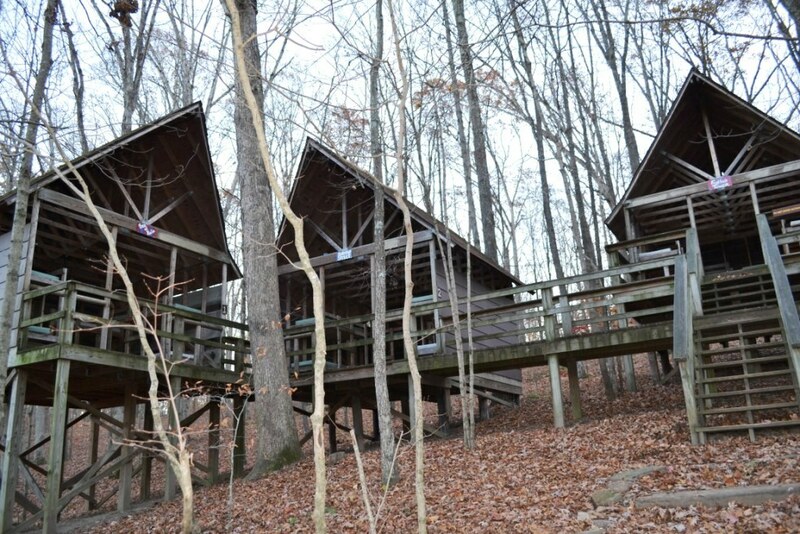 The cabins are fully enclosed, but do not have electricity. 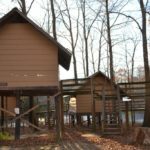 Mini Village is the perfect unit to introduce a young family to Camp and is completely alcohol and tobacco-free, year-round. 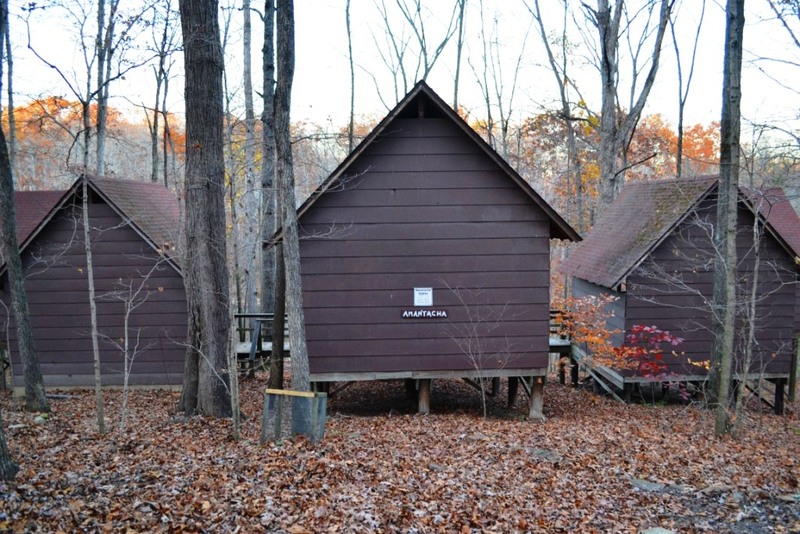 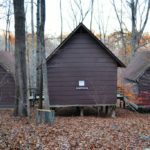 The 3-sided cabins of Brebeuf sit on the ground for ease of access and the unit is located slightly off the Camp Road keeping drive-by traffic to a minimum. 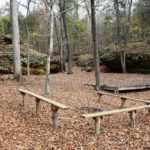 Brebeuf (pronounced bre-BUHF) is close to Shower House B and the entrance to the Amantacha Bridge making it a convenient location for hikes down the Cinder Path into the Shawnee National Forest. 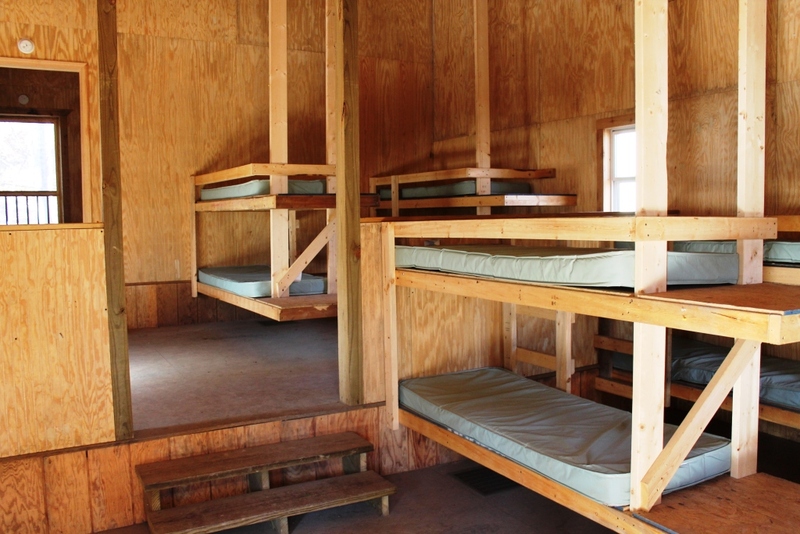 This unit has a capacity of 48 people in 6 cabins of 8 bunks. 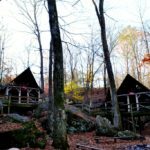 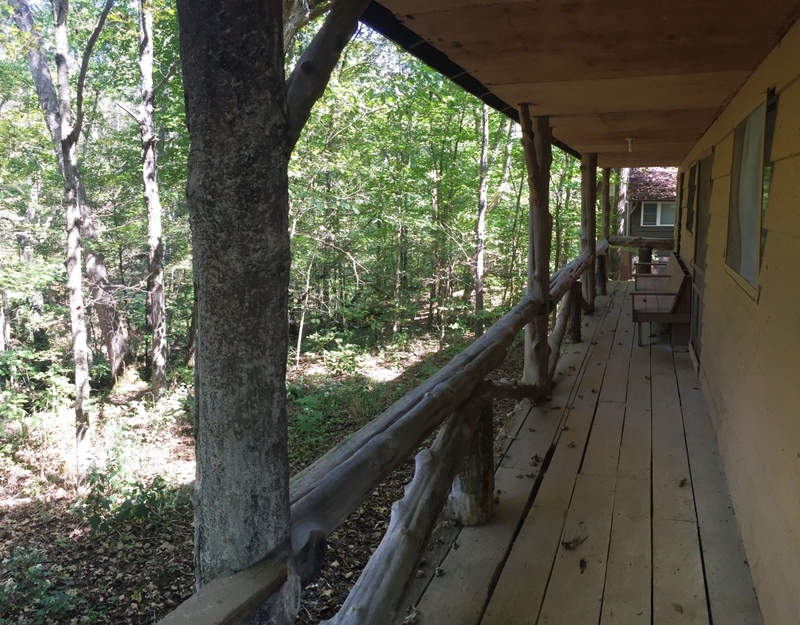 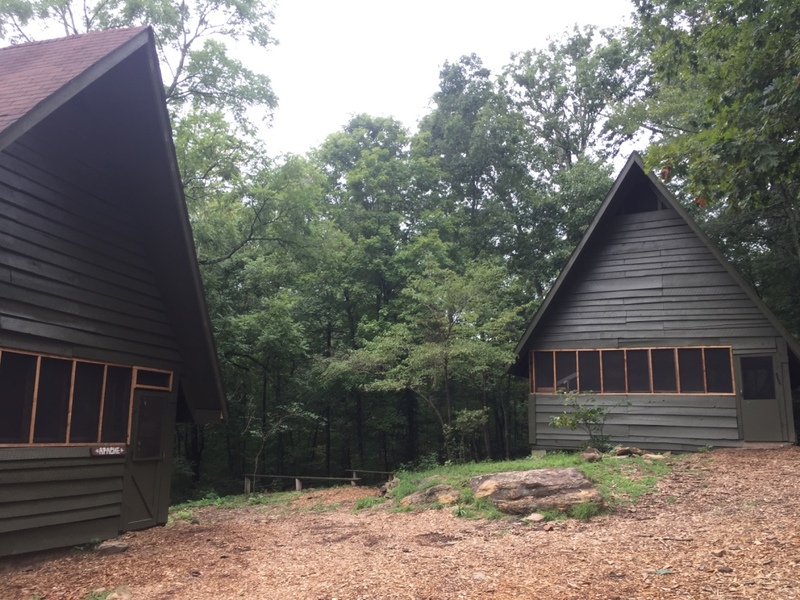 These newly-remodeled A-Frame cabins are fully enclosed and screened-in. 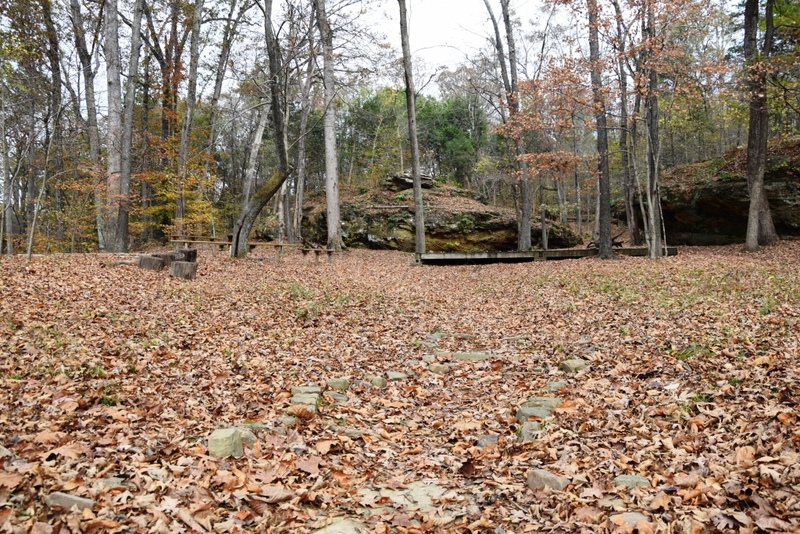 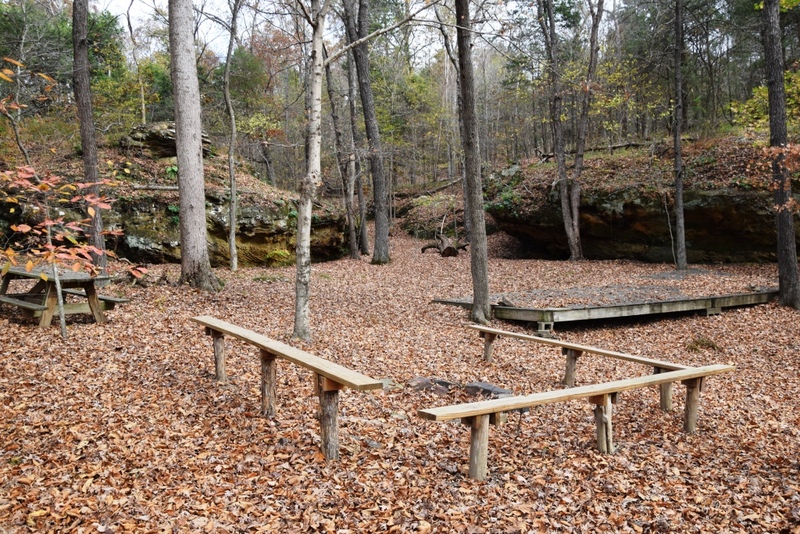 Tekakwitha (we pronounce it tek-ah-WITH-ah) is located along a bluff line and its fire pit is underneath a cozy sandstone cave making campfires a possibility in any weather. 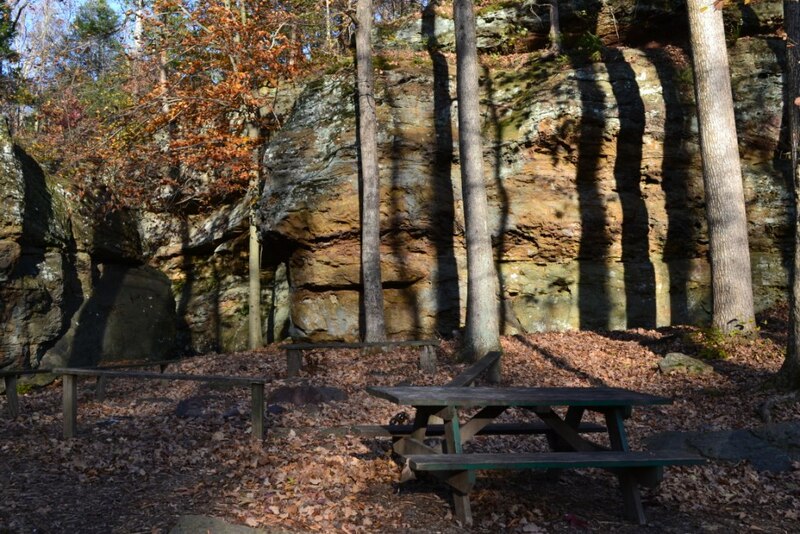 The unit is also at the entrance to Phantom’s Canyon making it perfect for taking day hikes into Camp’s West Side trails. 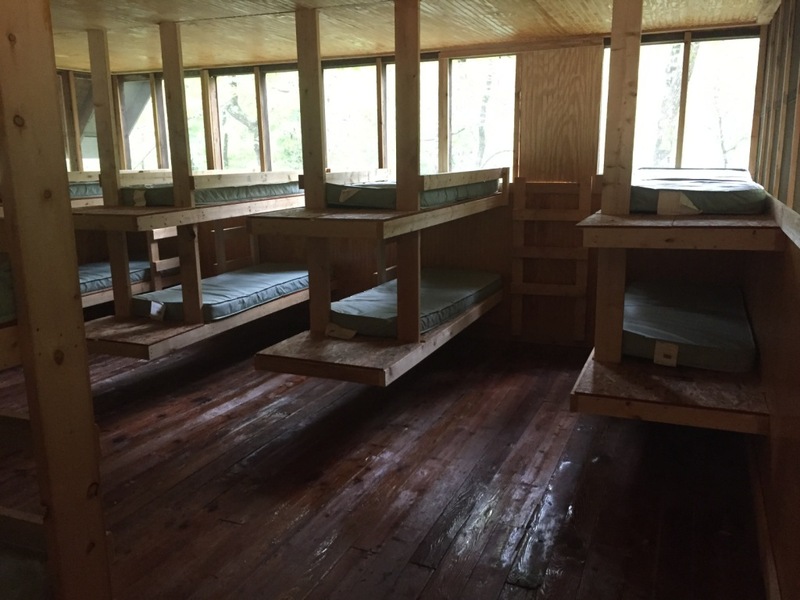 Tekakwitha has a capacity of 45 people in 3 cabins of 15 bunks. 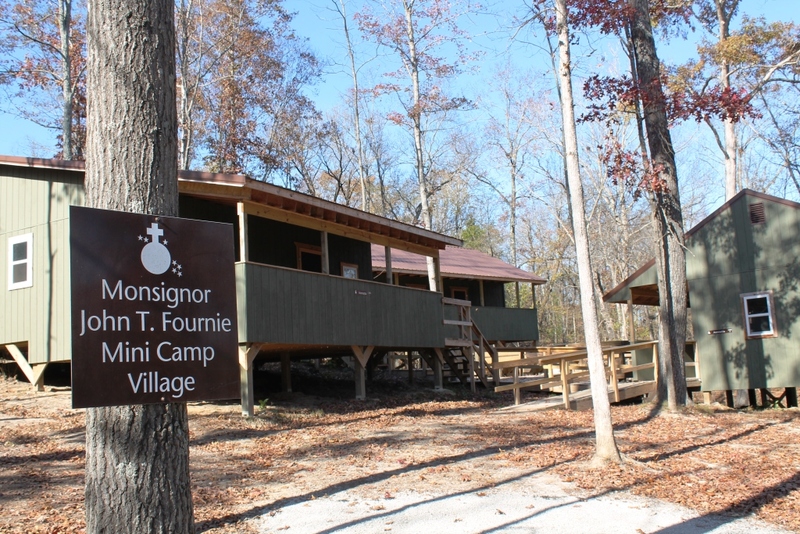 The unit of Raganeau is way back in the woods for those wishing to have a truly remote experience at Camp. 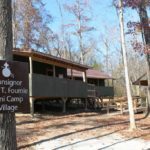 Raganeau (pronounced RAG-eh-no) is in one of the most scenic sections of woods at Camp and sits at the mouth of Phantom’s Canyon for ease of access to Camp’s West Side trails. 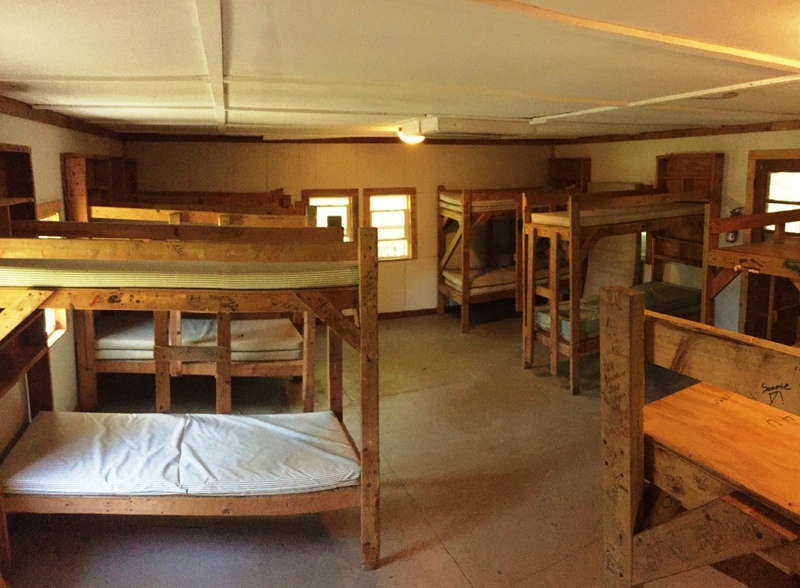 Raganeau has a capacity of 40 people in 5 cabins of 8 bunks. 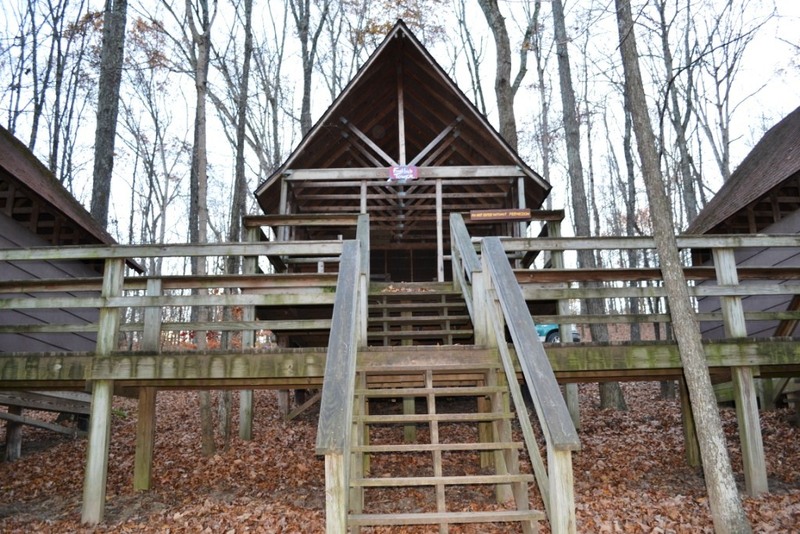 Take the swinging bridge over Lake Echon to this great lakeside treehouse unit. 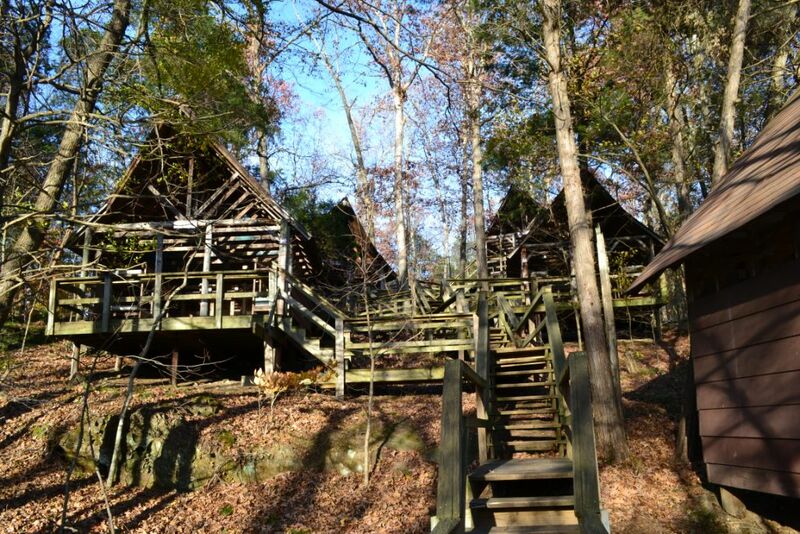 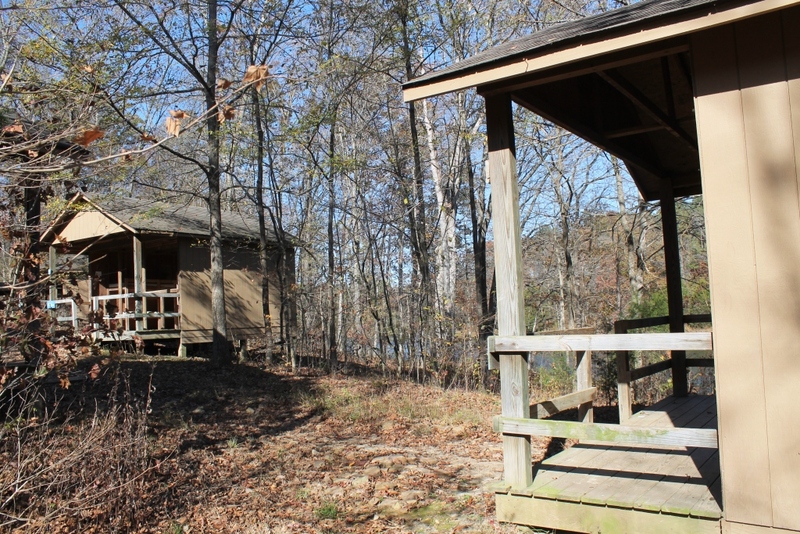 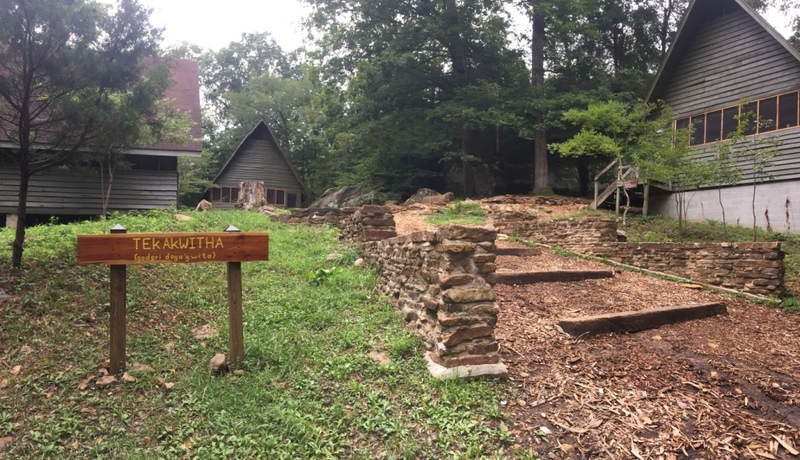 Amantacha is perched on a hillside overlooking the lake below and is a great location for folks who want to venture out into the surrounding Shawnee National Forest. 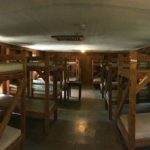 Amantacha (pronounced ah-man-TAHK-ah) has a capacity of 40 people in 5 cabins of 8 bunks each. 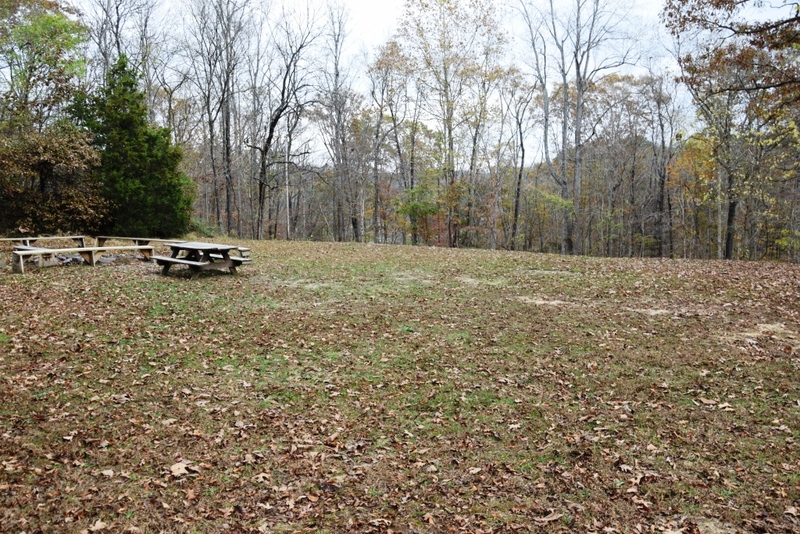 This grassy area right off the Camp Road is a great spot for a large group of tents. 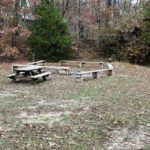 Brebeuf Flats has it’s own fire pit and benches, and shares an outhouse, year round water spigot, and trash receptacles with the adjacent Fournie Mini Camp Village. 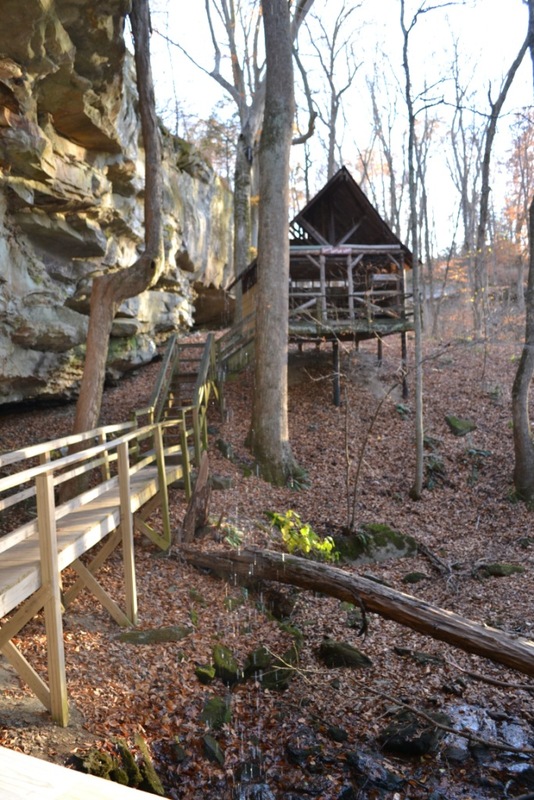 It also next door to Shower House B and very close to the Phantom’s Canyon trailhead. 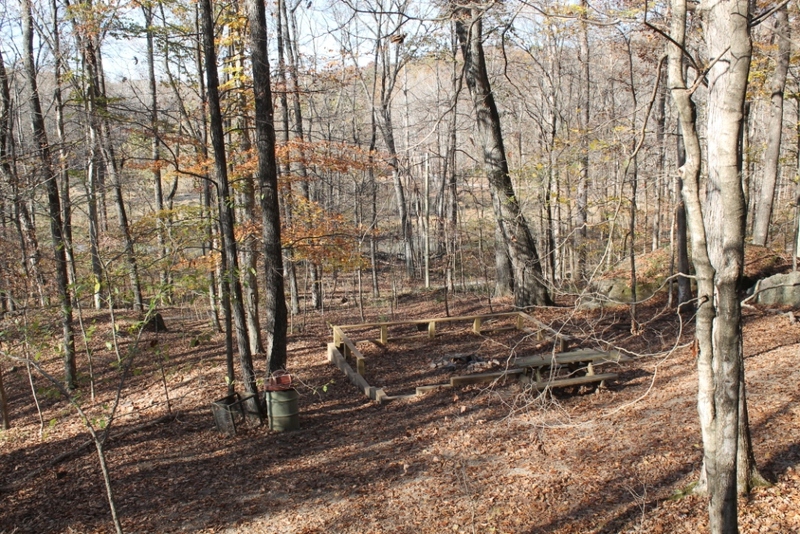 This area was once a cabin unit but the cabins have since been removed and the site repurposed as a tent camping area. 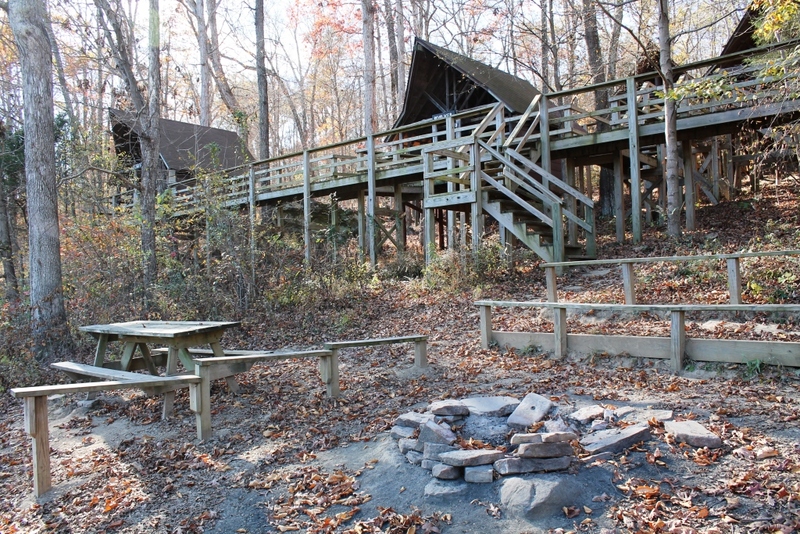 Ahatsistari (pronounced ah-HAS-i-tari) has a wooden tent platform, outhouse, fire pit, benches, picnic table, trash can, and shares a year-round water spigot with the adjacent unit of Goupil. 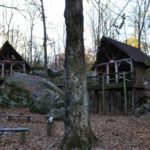 This may be the most unique camping area at Camp. 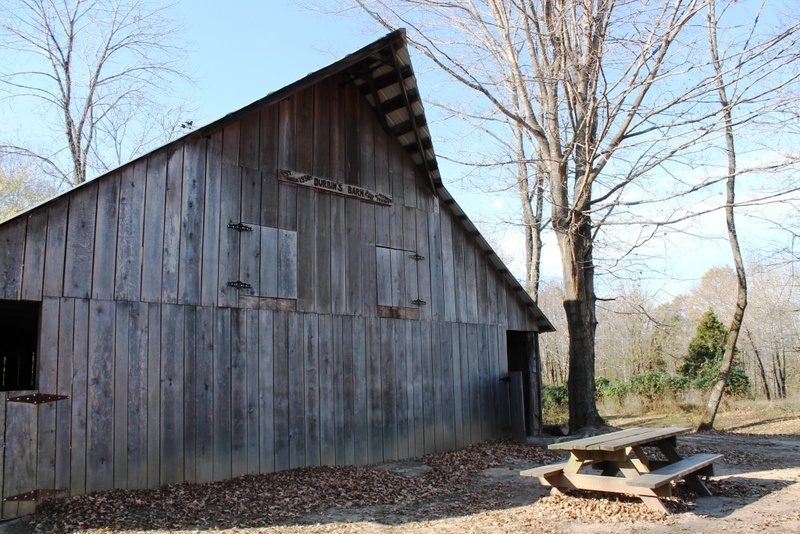 Durbin’s Barn was built in the 1930s and restored by Camp in 2011 but still maintains its old-fashioned charm. 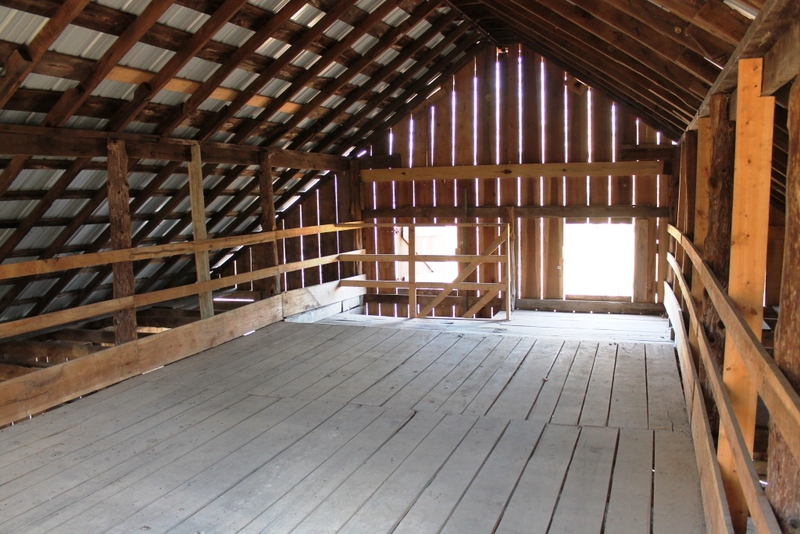 The ground floor and the loft upstairs have plenty of room for large groups. 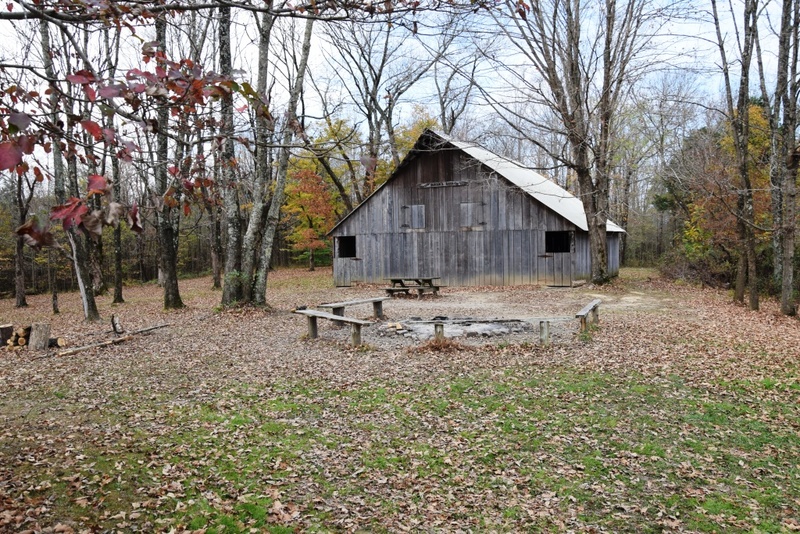 Durbin’s Barn has a fire pit, benches, picnic table, and outhouse. 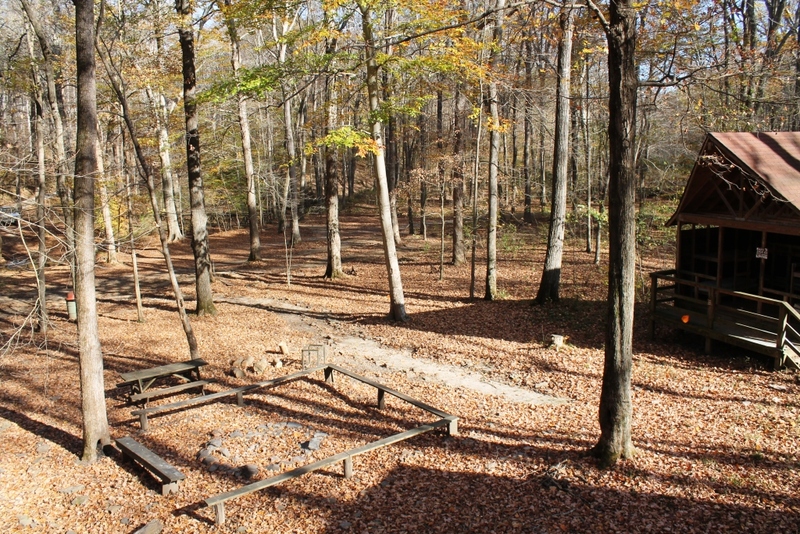 Water is not available but visitors are welcome to fill up their own water jugs from any spigot in the main area of Camp. 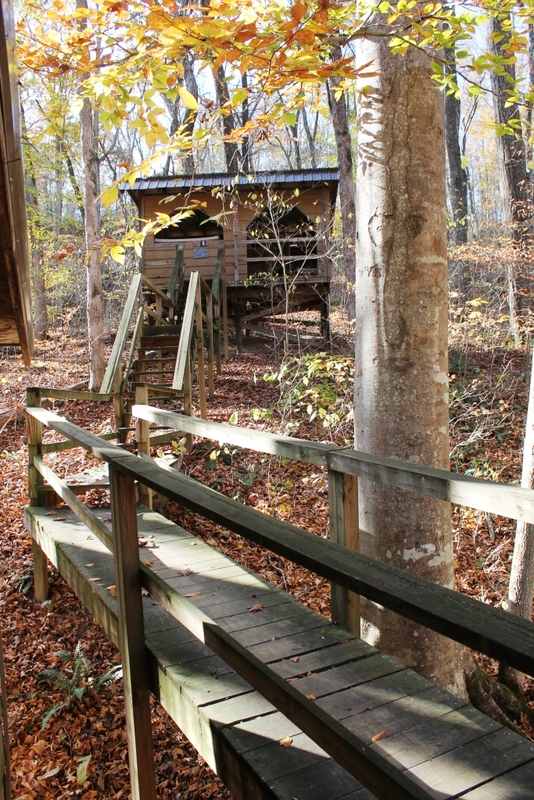 The road going up to Durbin’s Barn from the main area of Camp is only advised for high clearance, 4-wheel drive vehicles and is best accessed via Camp’s back gate which can be unlocked for you. 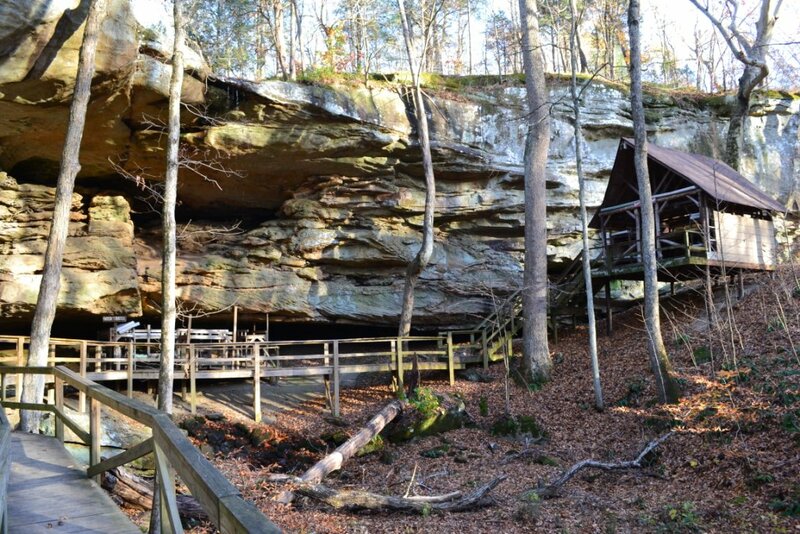 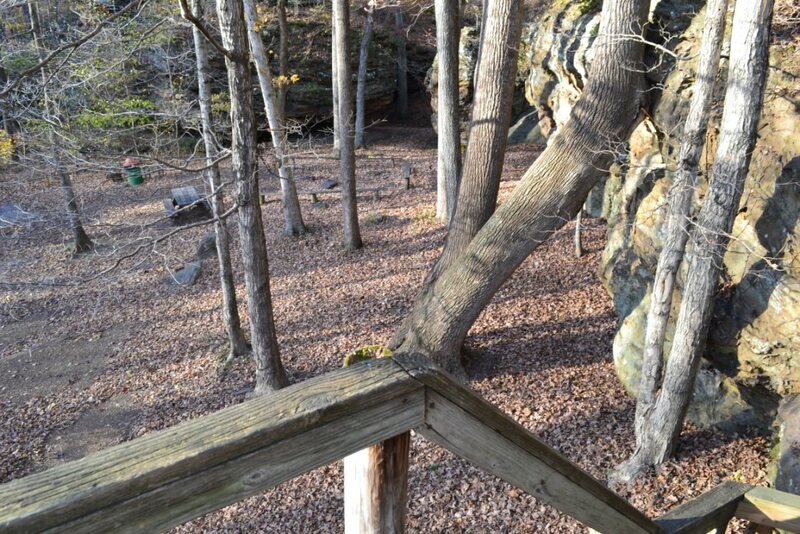 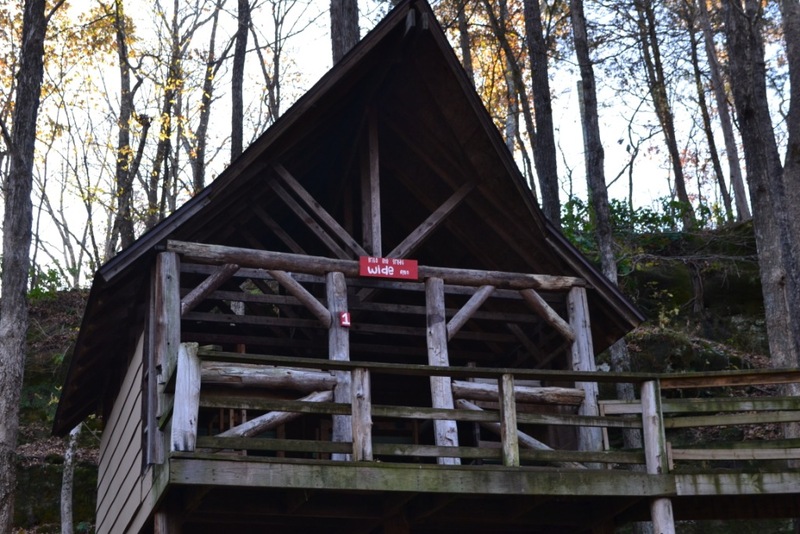 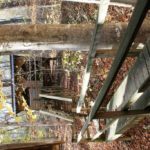 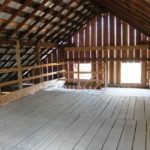 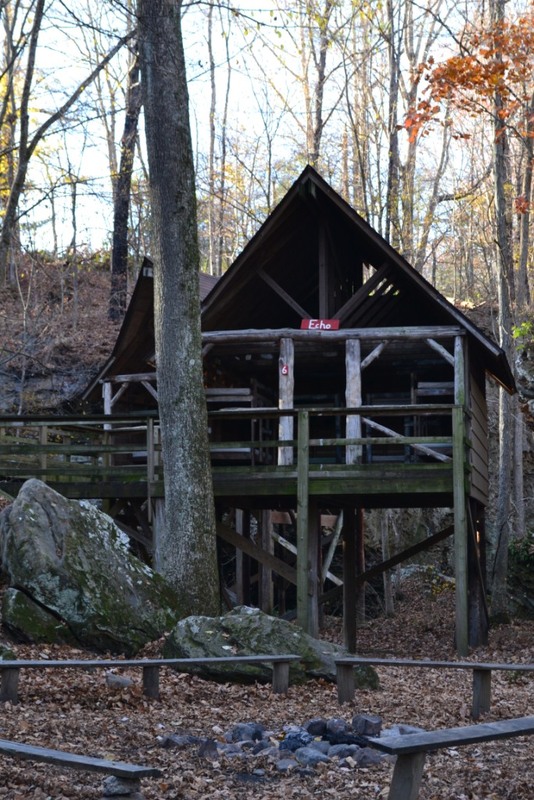 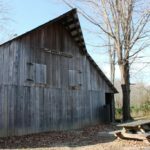 Durbin’s Barn is perfectly located for hikes to the Pakentuck area and the greater Shawnee National Forest. 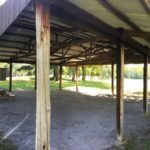 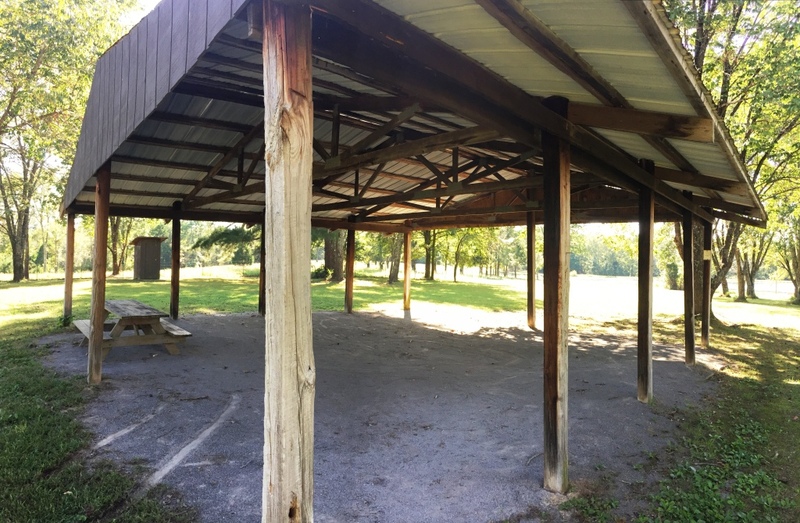 Kane Lake boasts a large park-like setting with it’s own pavilion shelter. 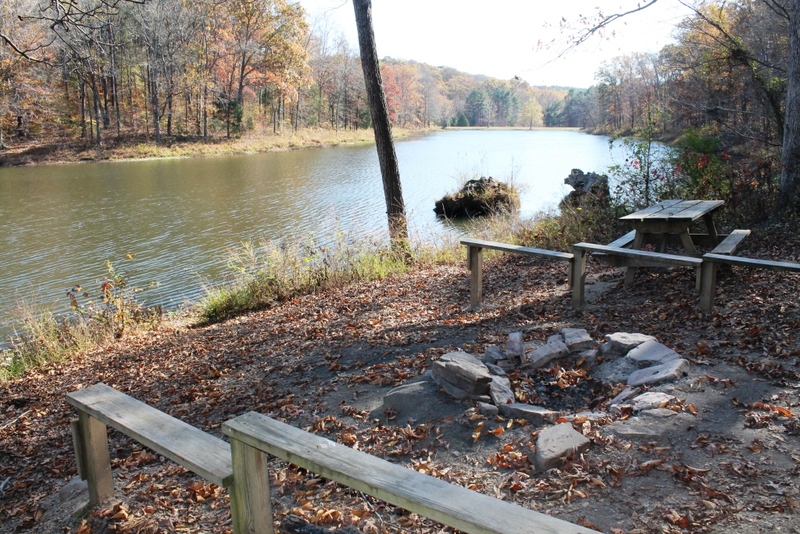 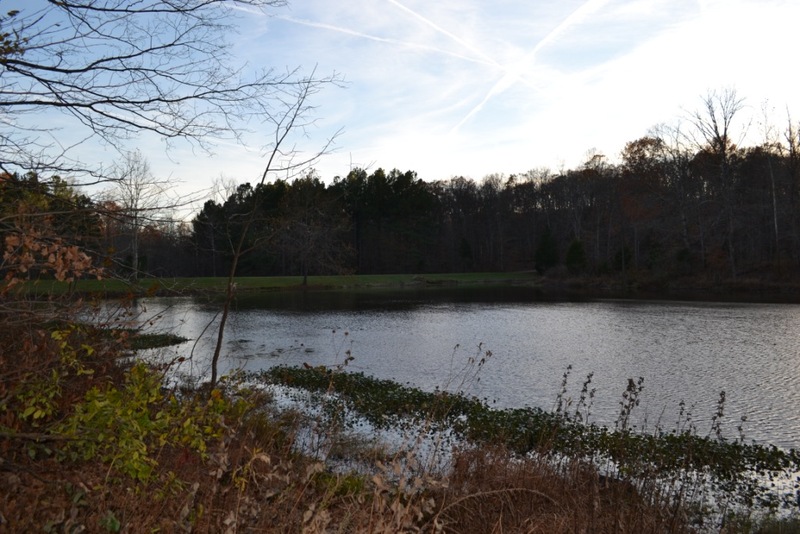 Kane Lake is a favorite of local fisherman and a great spot to base camp while taking day hikes to the Pakentuck area. 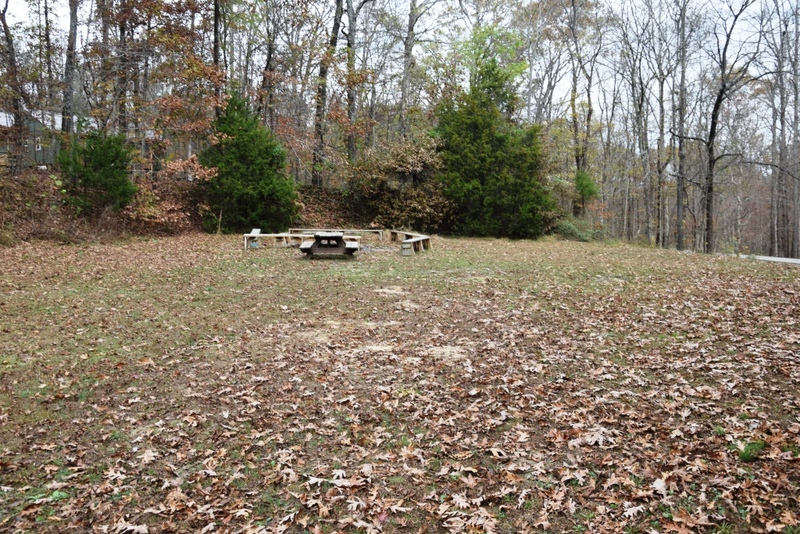 The site also has an outhouse, firepit, benches, and picnic tables. 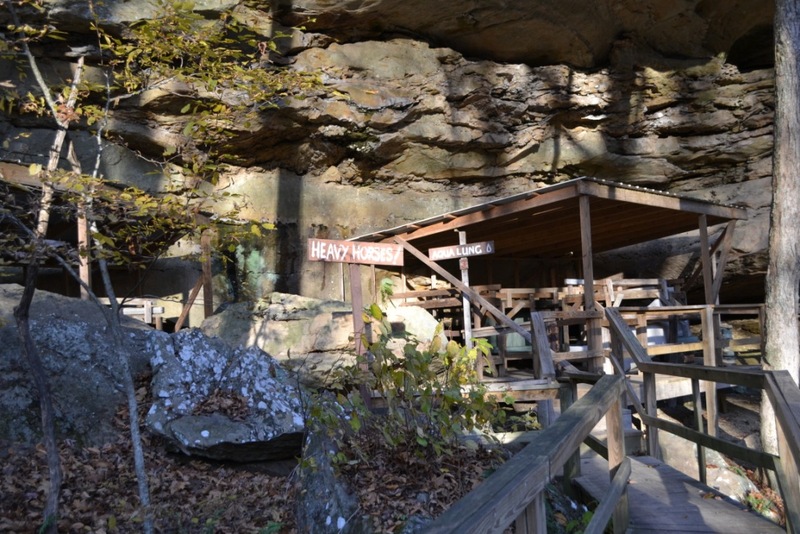 Water is not available but visitors are welcome to fill up their own water jugs from any spigot in the main area of Camp. 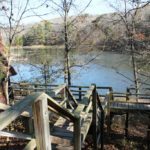 The road going up to Kane Lake from the main area of Camp is only advised for high clearance, 4-wheel drive vehicles and is best accessed via Camp’s back gate which can be unlocked for you. 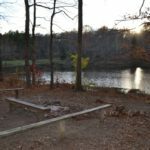 One of the furthest out overnight spots on Camp property, Pine Lake is a very secluded and picturesque spot for those wishing to get away from the main area of Camp. 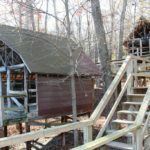 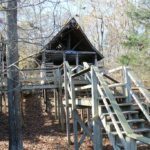 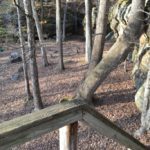 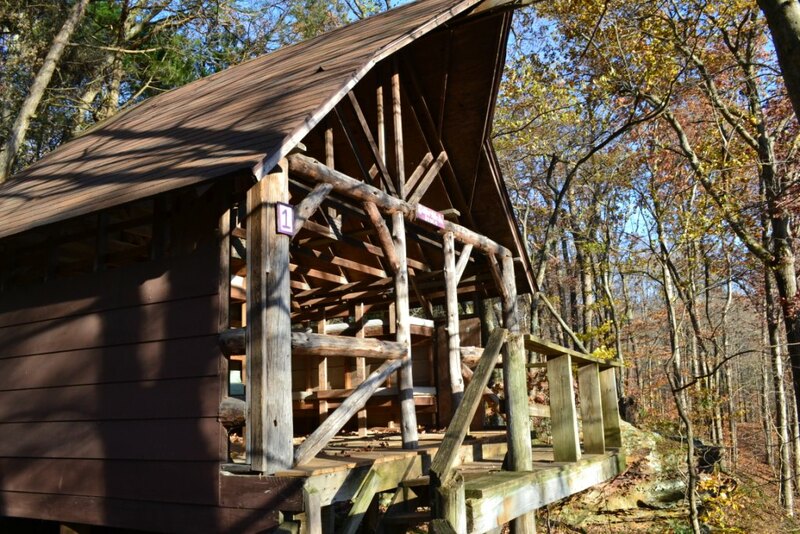 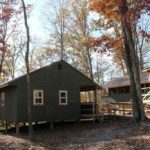 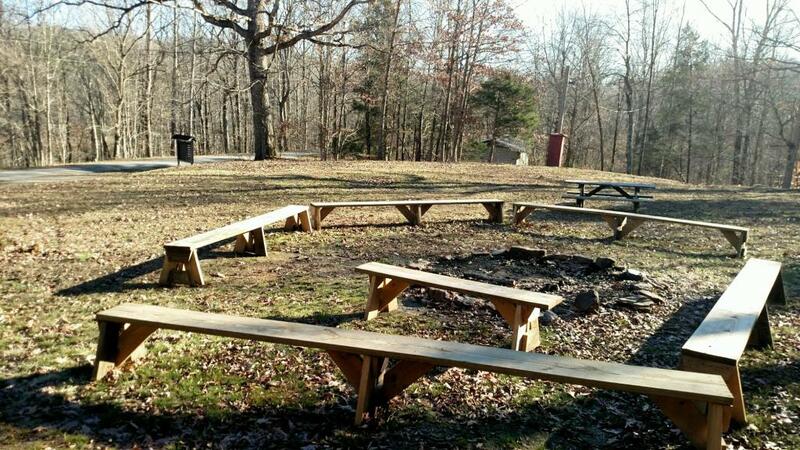 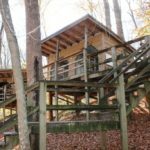 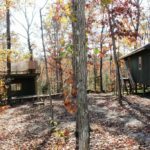 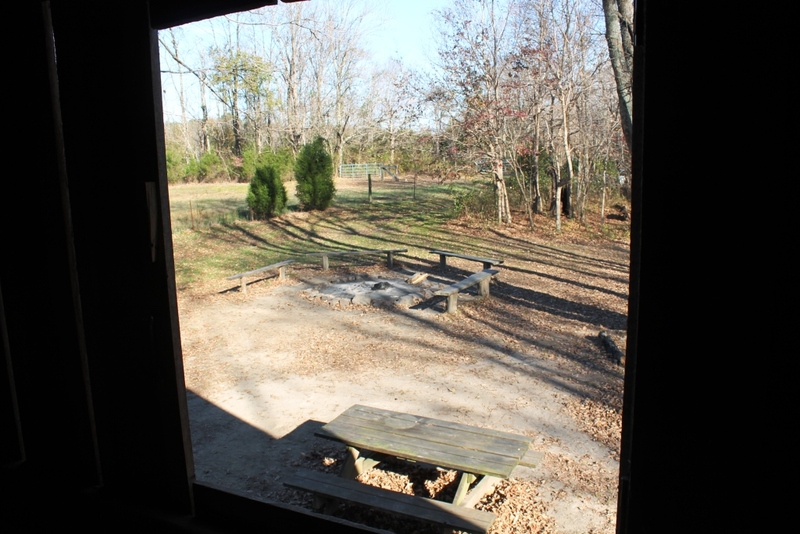 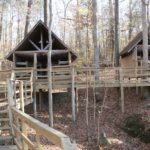 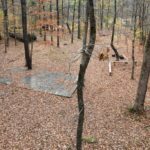 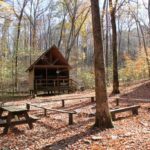 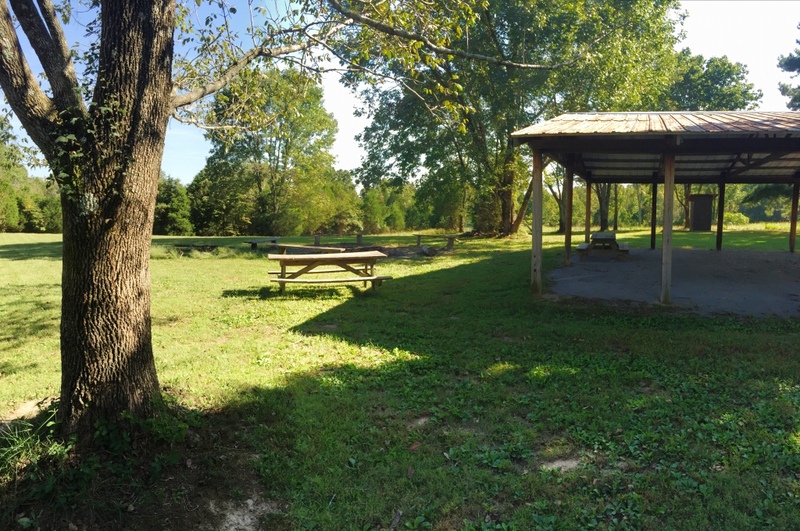 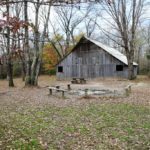 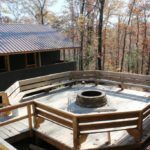 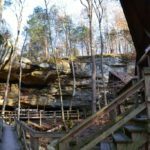 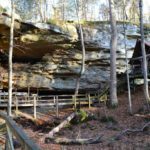 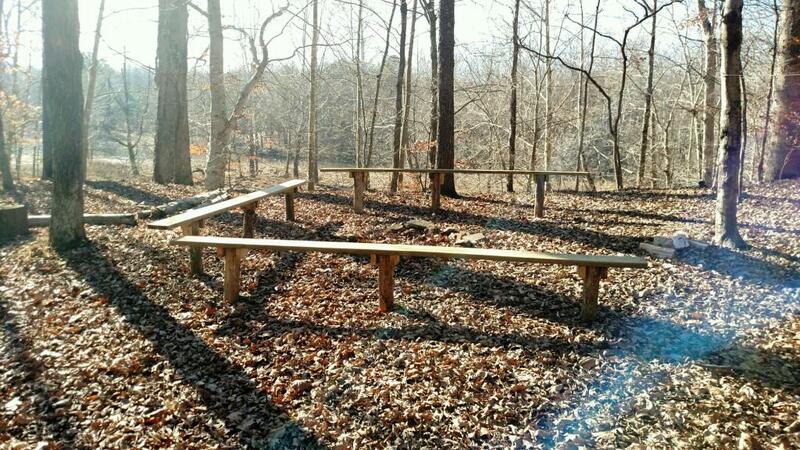 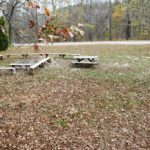 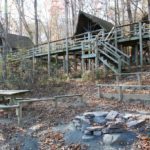 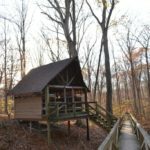 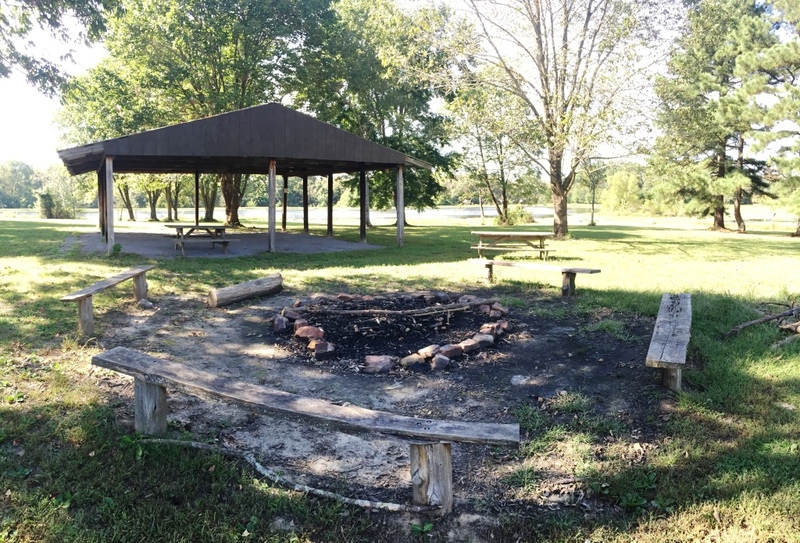 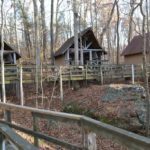 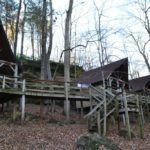 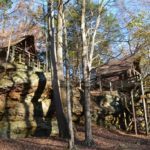 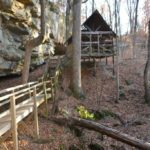 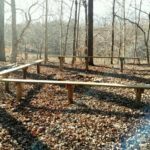 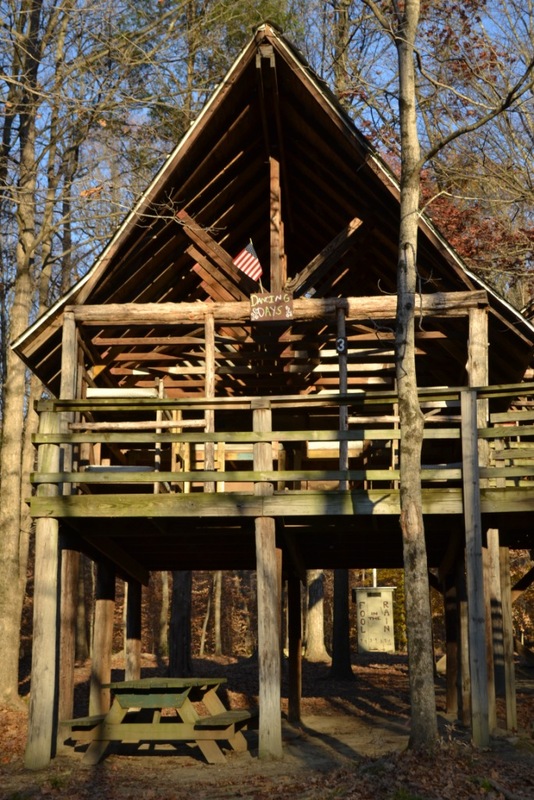 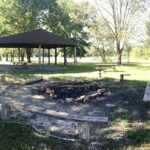 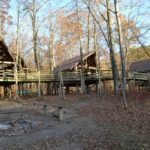 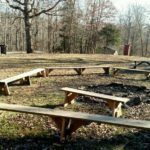 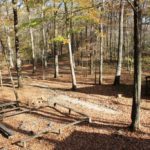 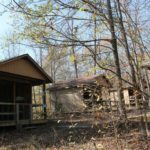 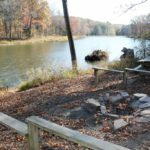 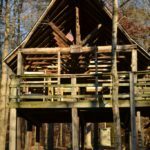 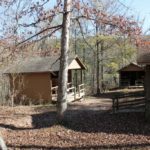 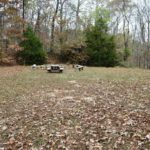 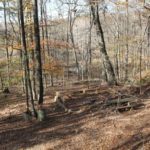 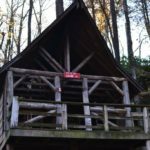 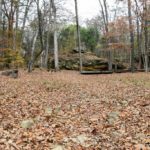 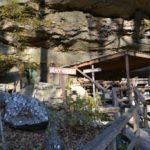 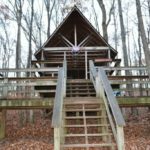 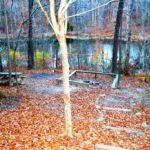 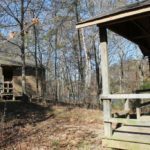 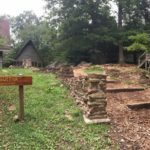 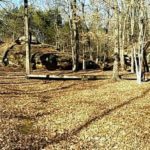 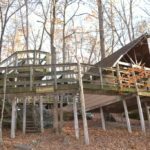 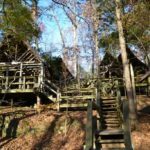 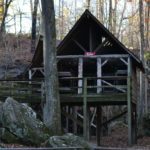 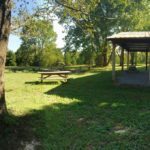 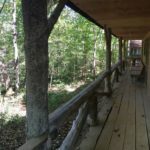 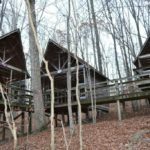 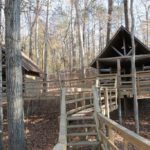 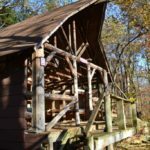 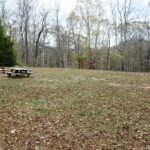 There is a fire pit and benches, a pavilion to keep you dry in rainy weather, and great access to trails leading into the Shawnee National Forest. 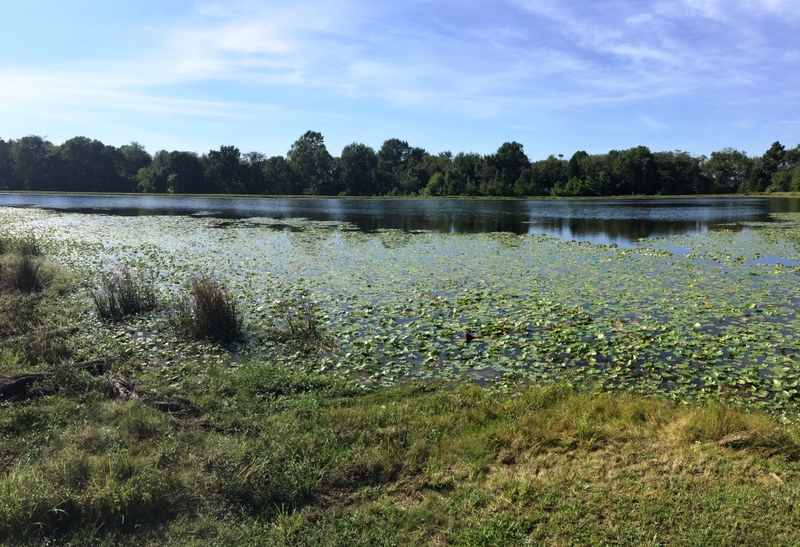 There is no outhouse or potable water at Pine Lake so this spot is truly roughin’ it. 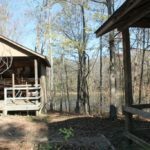 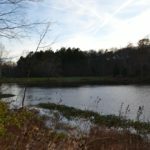 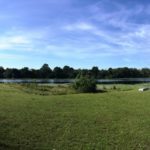 Access to Pine Lake is off of Pakentuck Road and folks must park there and walk the quarter mile trail back to the lake. 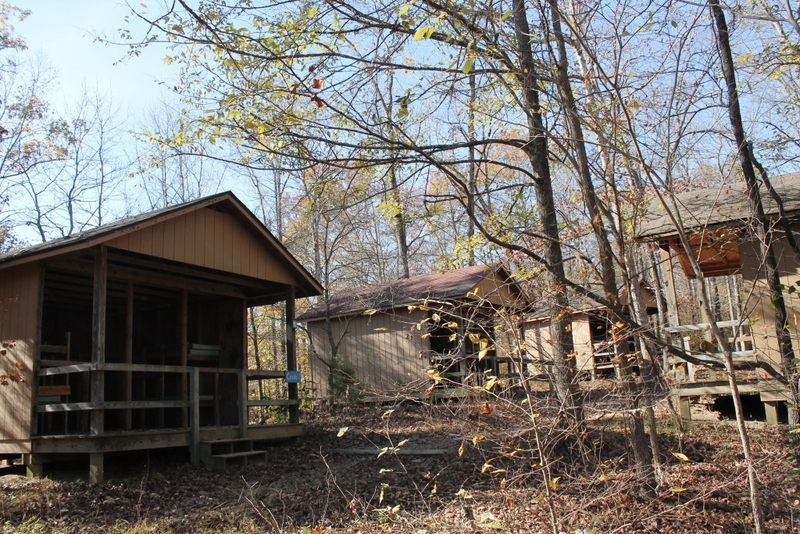 The Dorms are located right off Camp’s main parking lot and perfect for those not wishing to fully rough it in the colder months of the year. 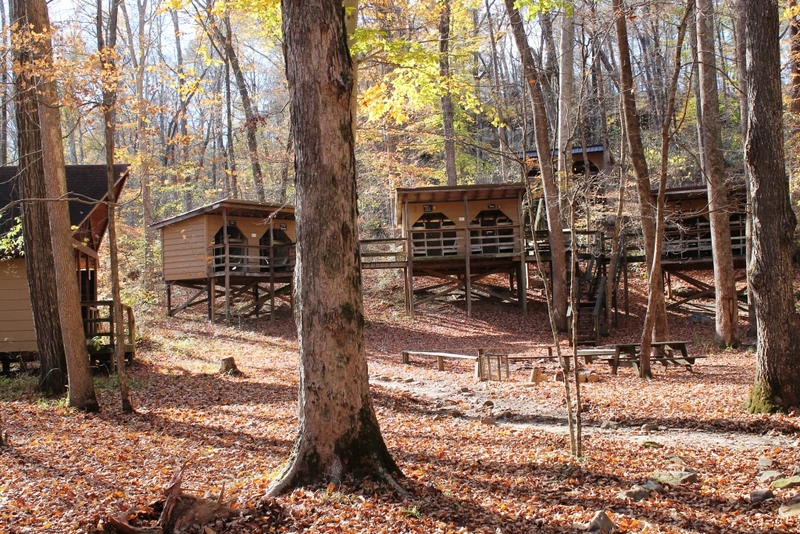 There are two cabins; the Upper Dorms and the Lower Dorms. 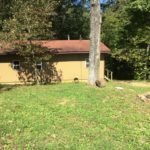 Each have a covered front porch, electricity, and heat. 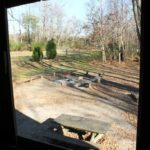 They share a fire pit area and are next to a heated shower house. 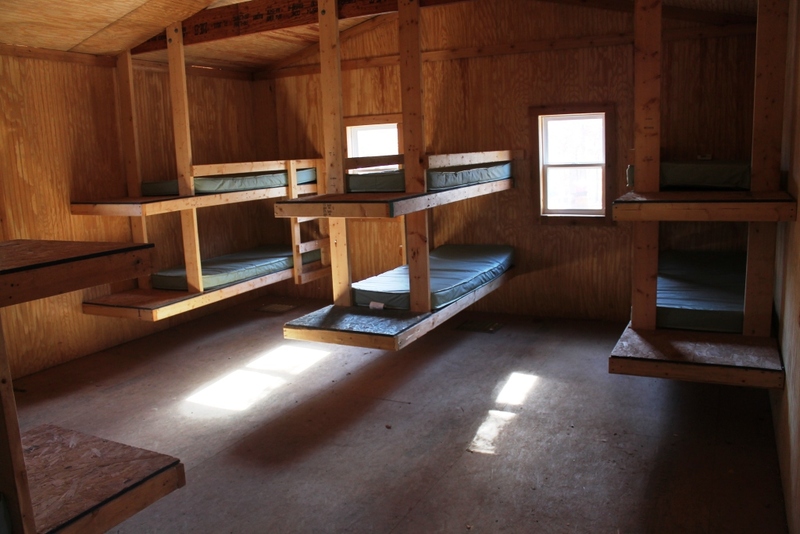 The Upper Dorms sleeps 22 people; the Lower Dorms, 27 people. 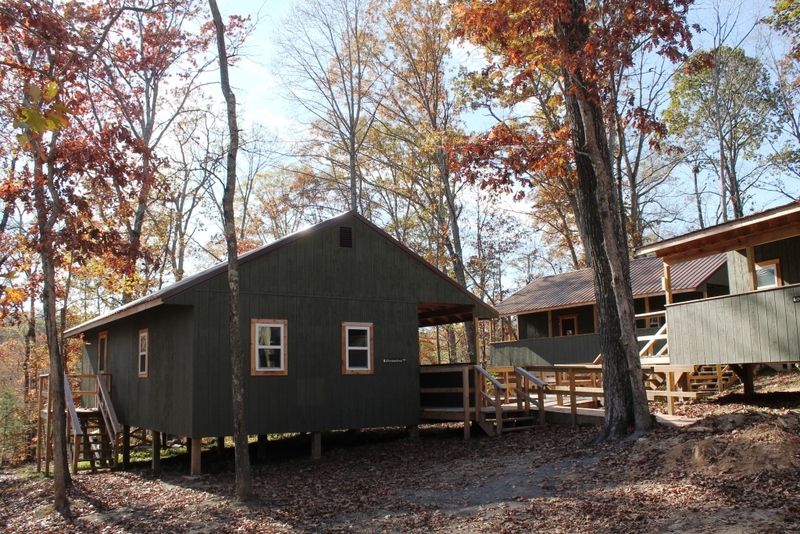 The Bachelors Officer’s Quarters is very close to the main area of Camp and sleeps 26 people. 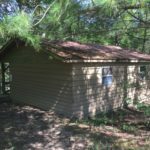 It is fully enclosed with electricity and a covered front porch. 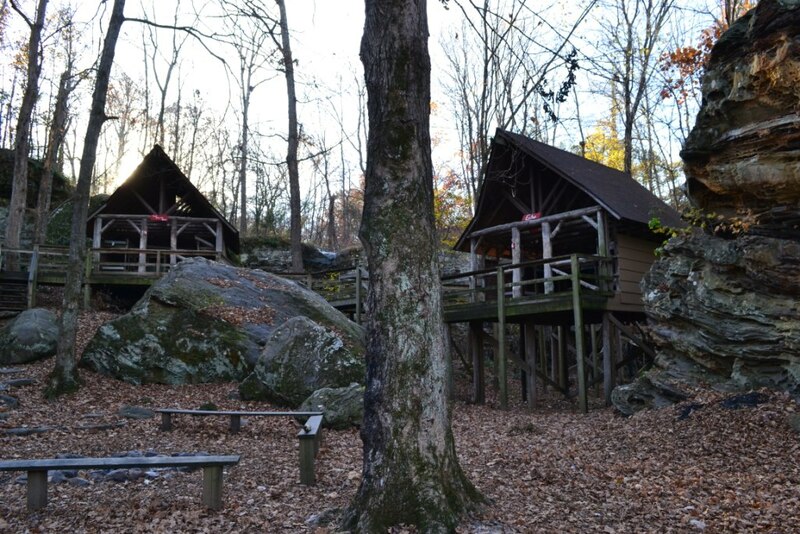 There is no heat but guests are welcome to bring electric heaters – no gas please. 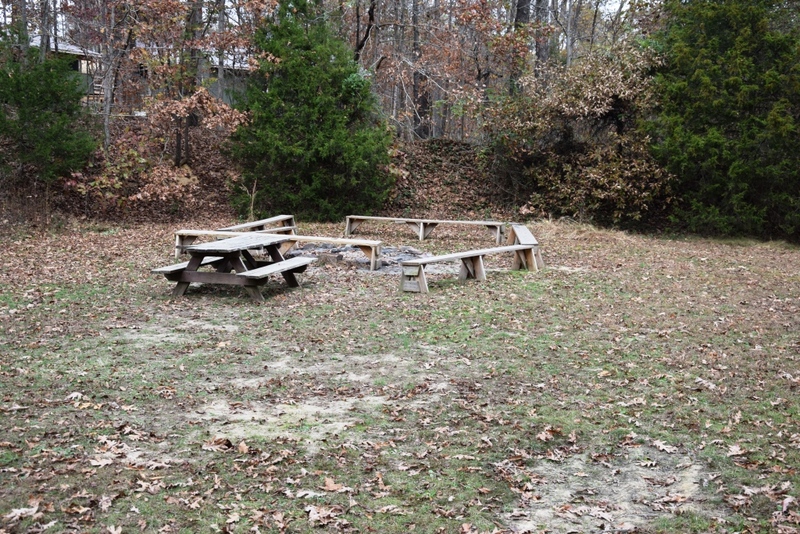 There is also a fire pit area with benches and a picnic table. 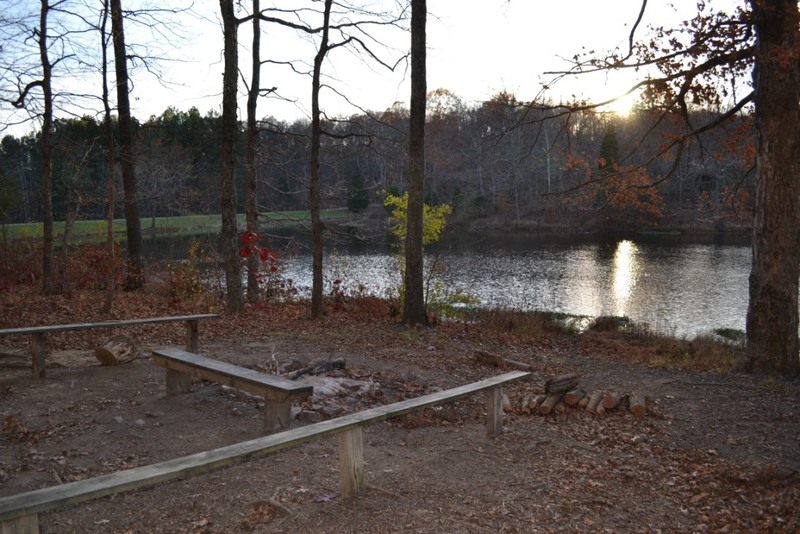 The BOQ is perfect for bigger groups coming to Camp in the chillier months of the year.